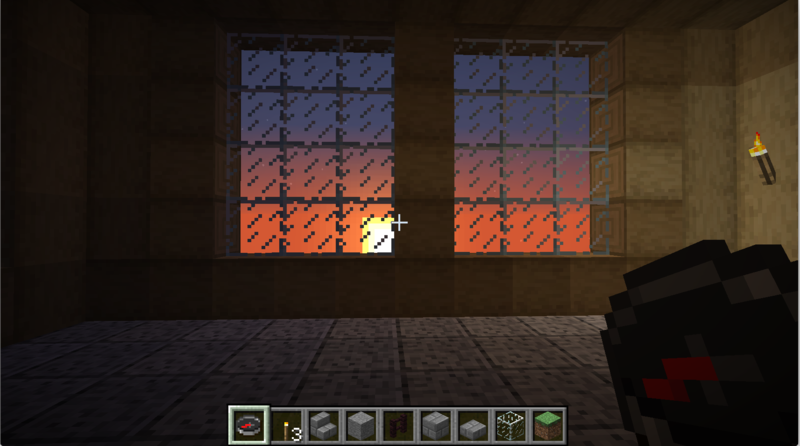 I’m sure I’ve taken very similar pictures to this before. 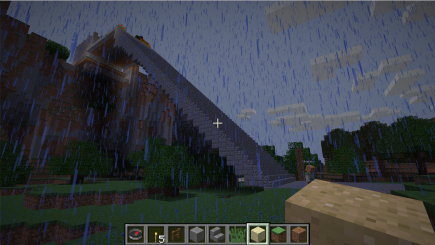 Those stairs affect my mountain more than I expected. Another view of how the stairs look in context. 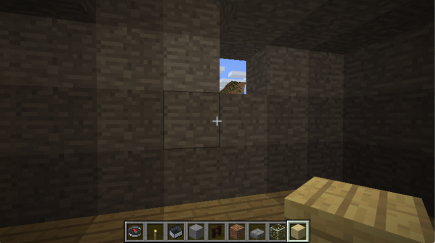 The area to the right of the windows looks promising. My initial reaction was that those stairs that Dan built are a little overwhelming. 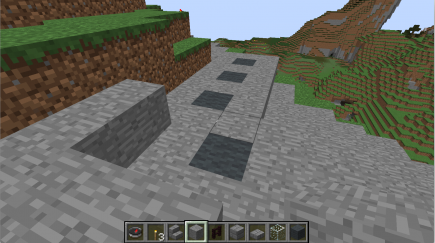 He wasn’t there this month, unfortunately, but maybe next month I’ll ask him if he would mind if I made them significantly narrower? 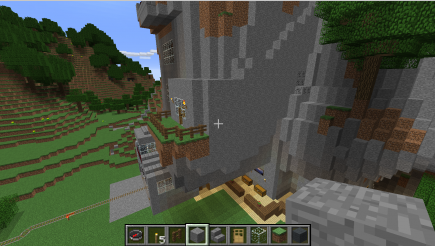 I’d been thinking of building more around the shop area, maybe extending it to the path through the base of the mountain, but when I was flying around, there’s this area that sticks out a bit to the right of the windows, and I was thinking maybe I could turn that into a sort of corner tower. So I decided to add another set of rooms there. 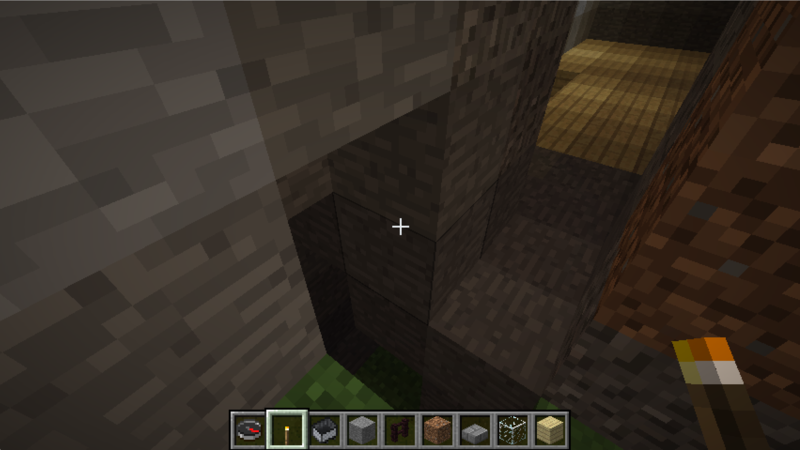 Digging my way into the corner. 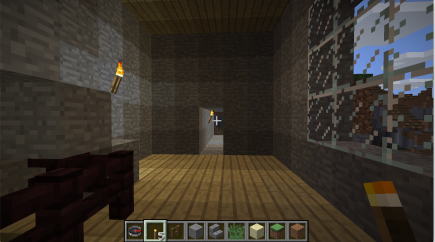 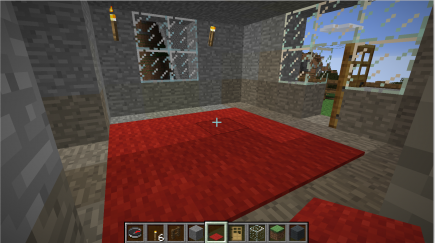 Here’s the first stab of the shape of the room, without regularizing the wall blocks at all. 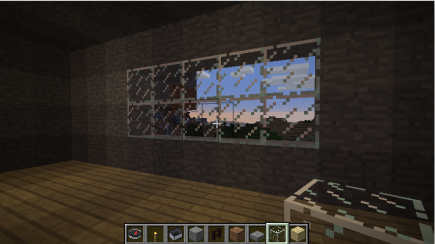 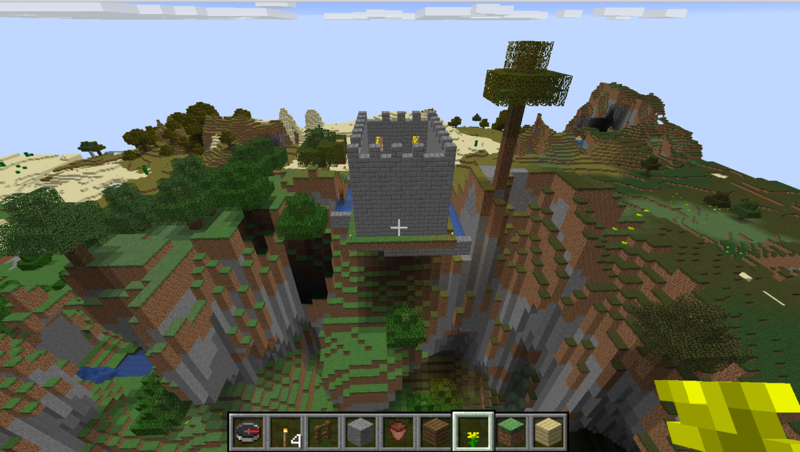 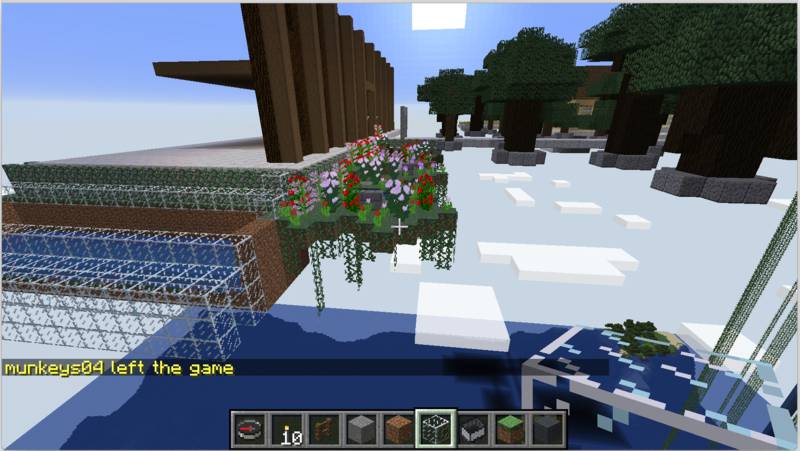 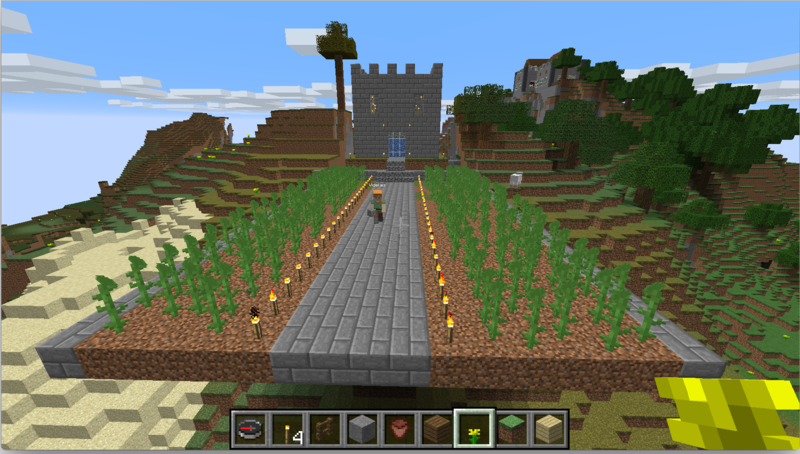 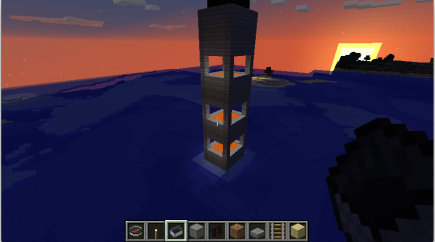 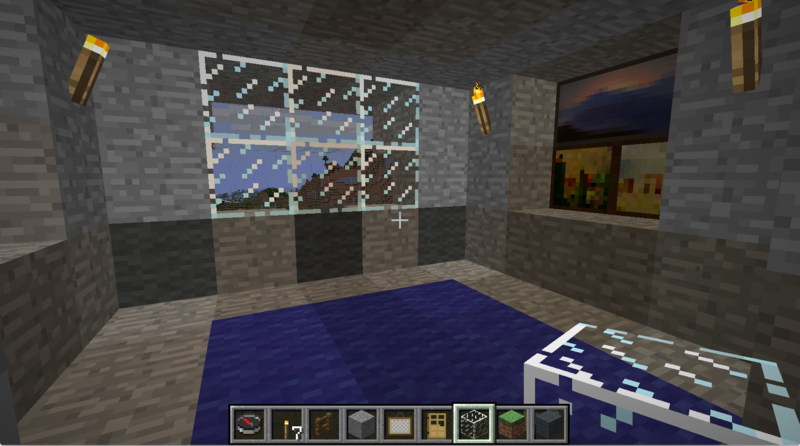 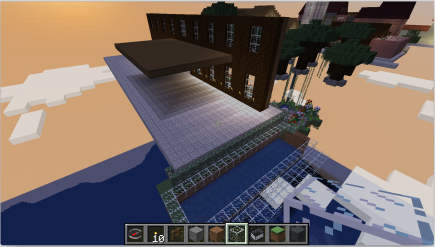 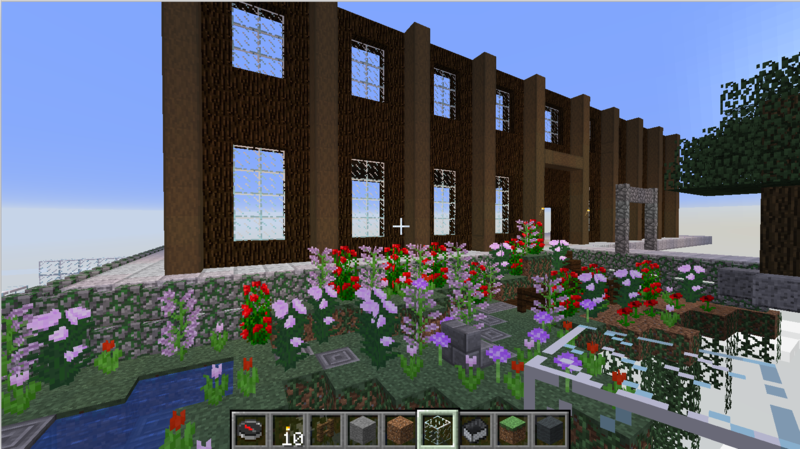 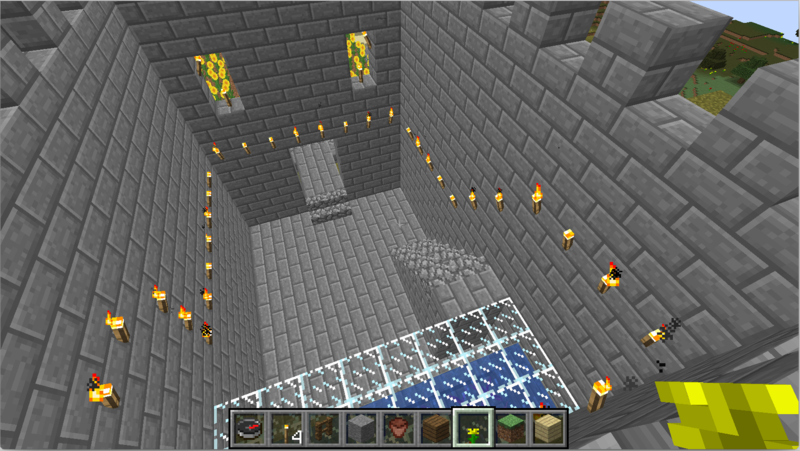 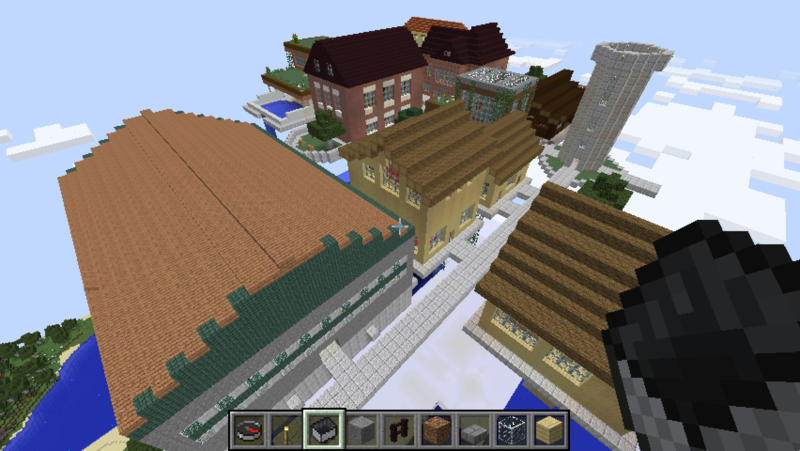 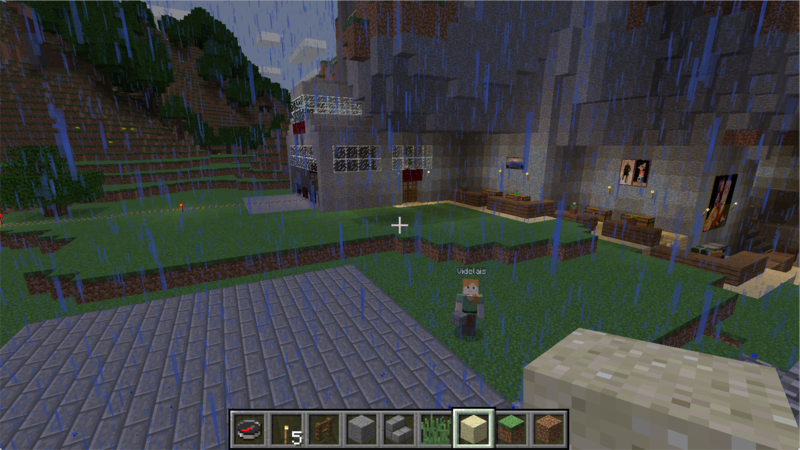 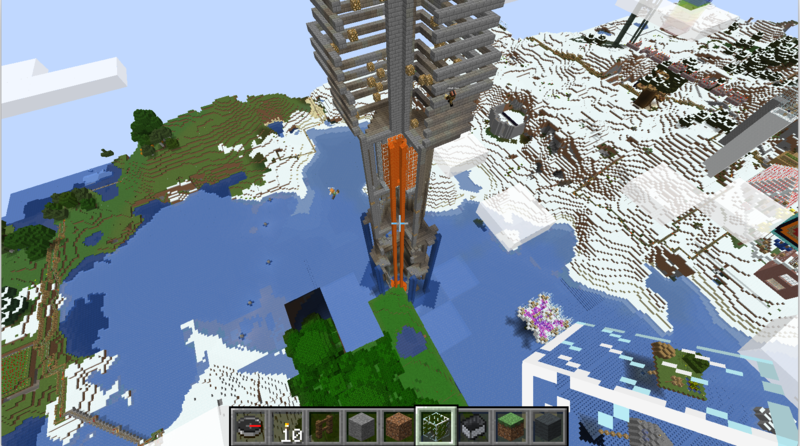 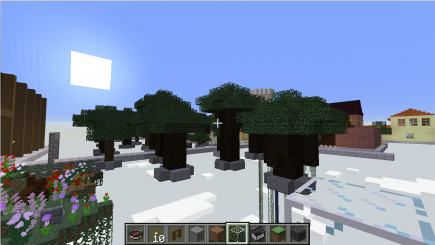 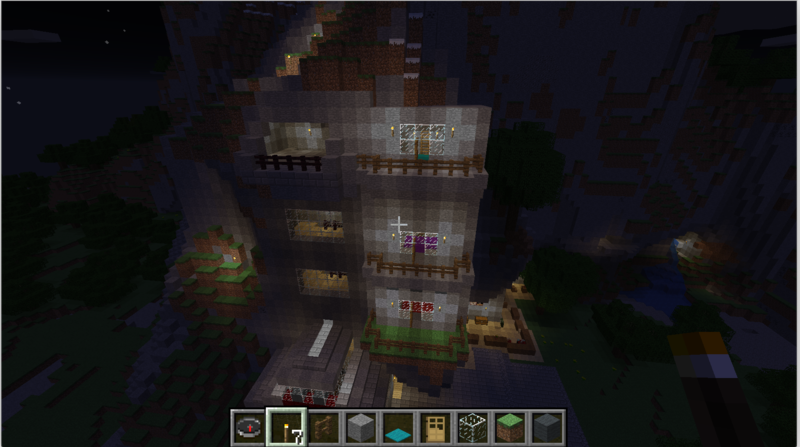 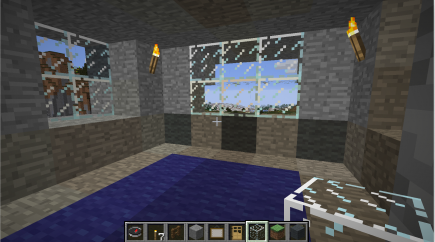 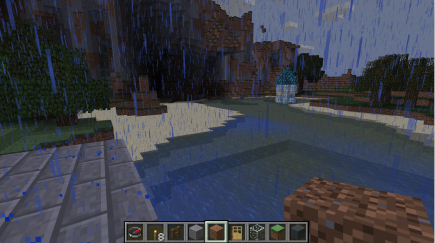 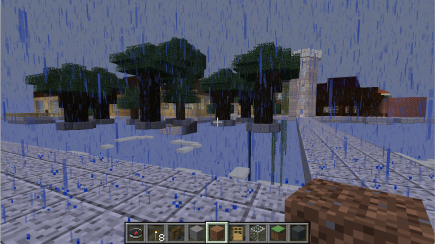 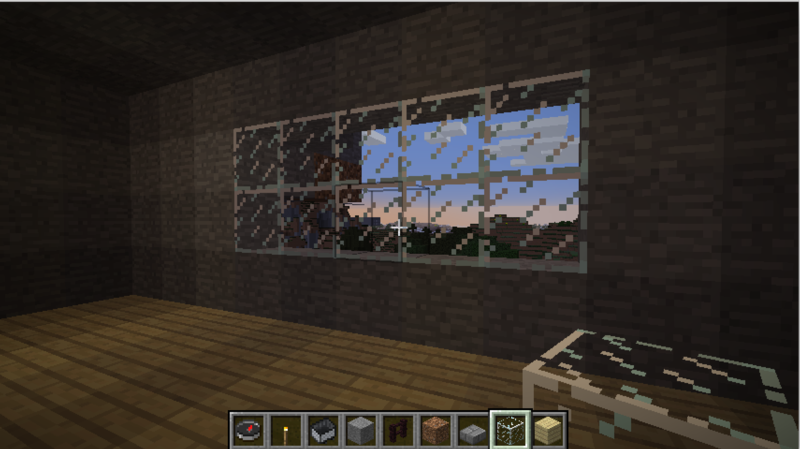 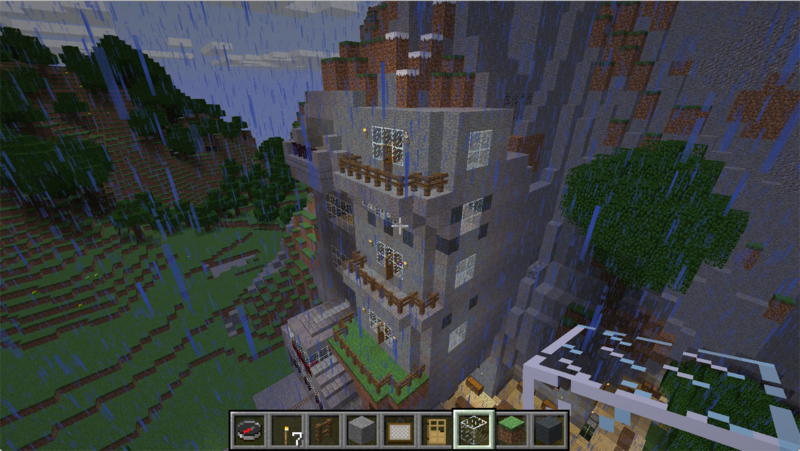 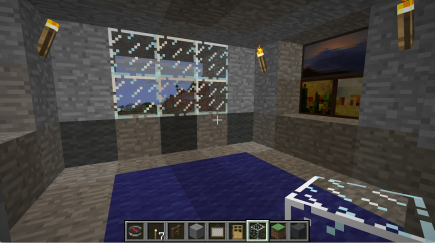 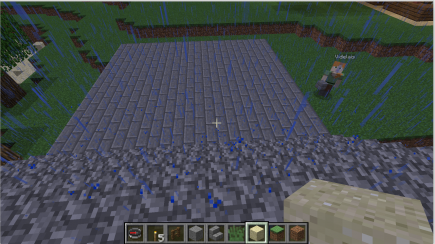 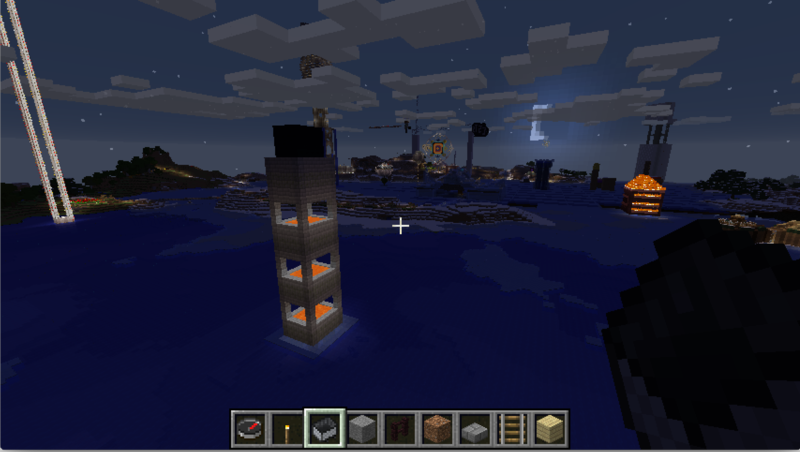 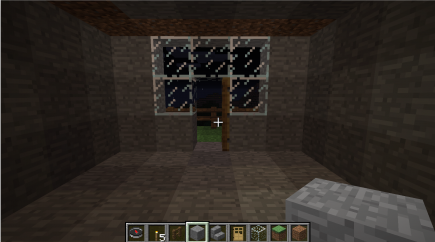 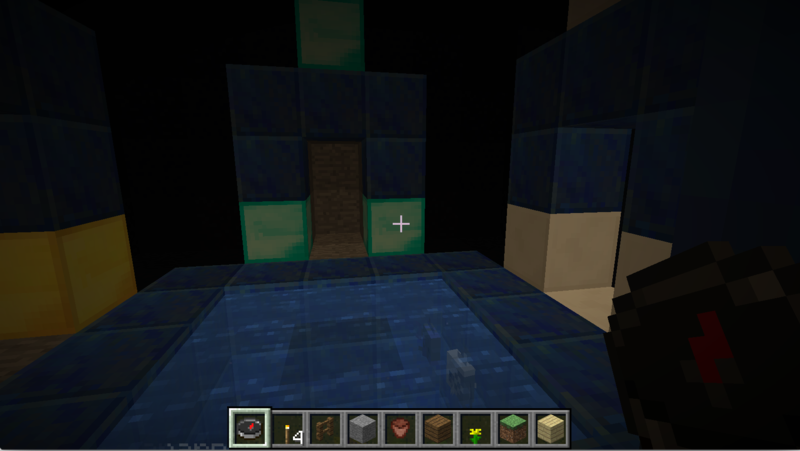 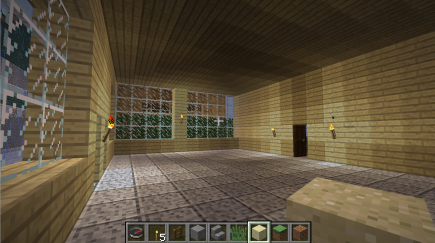 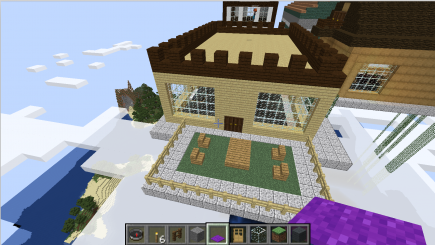 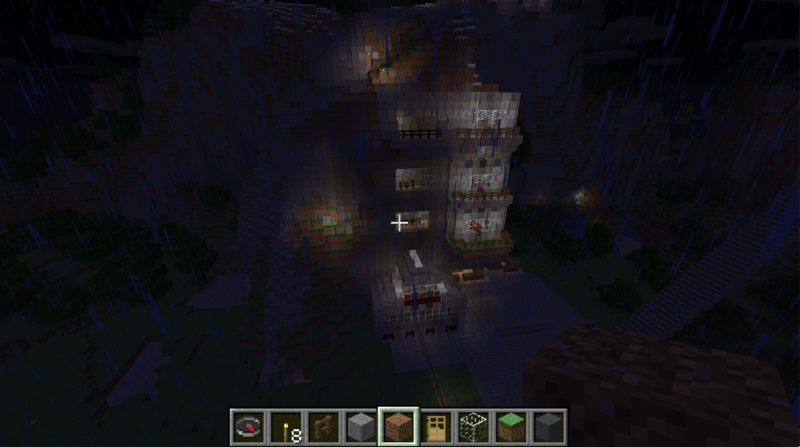 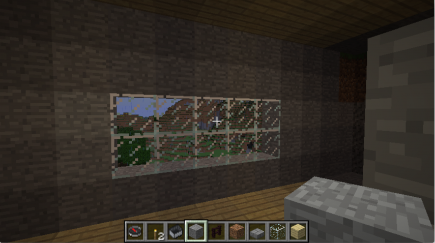 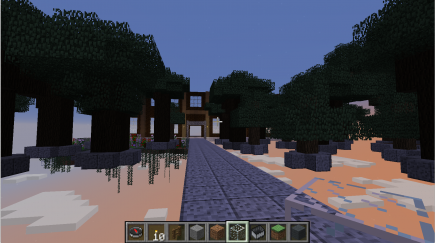 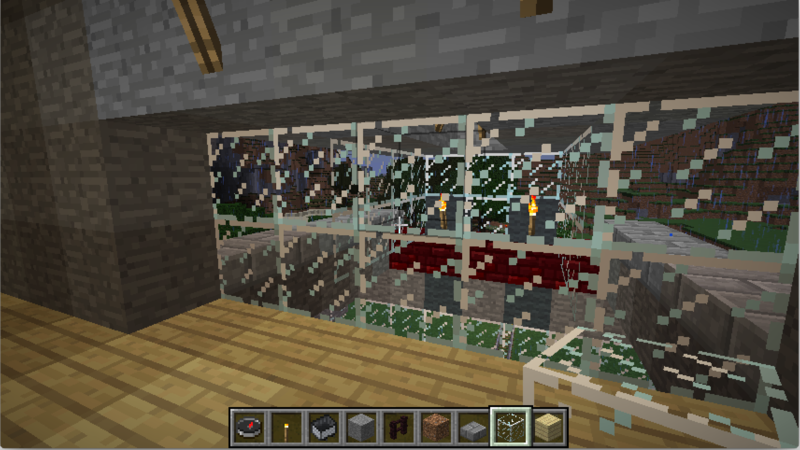 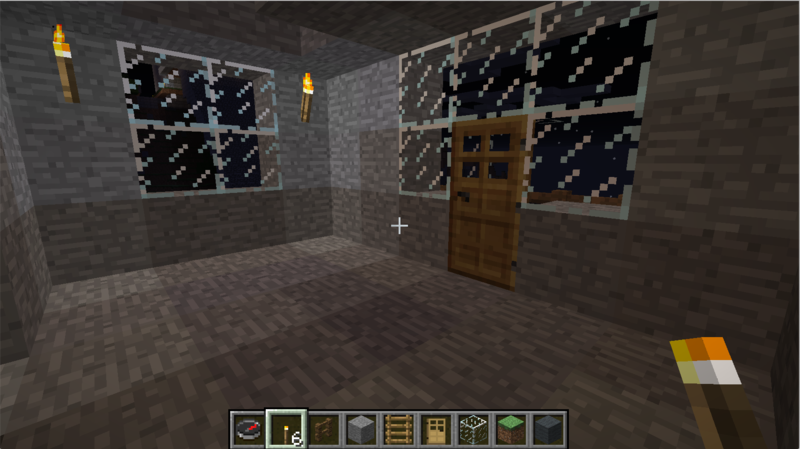 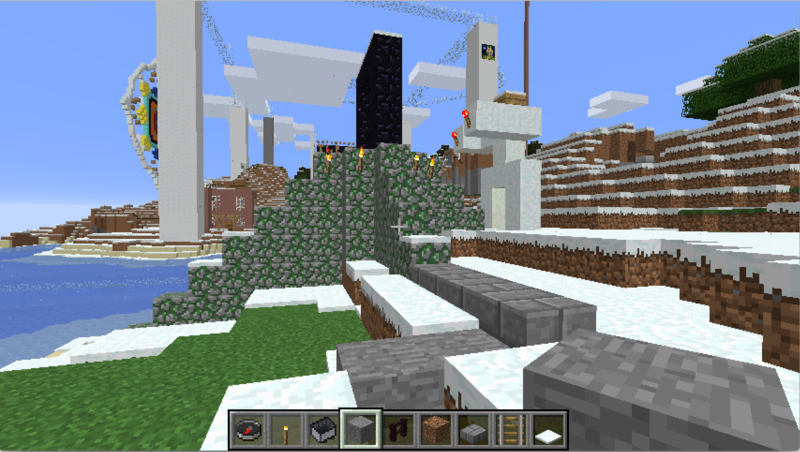 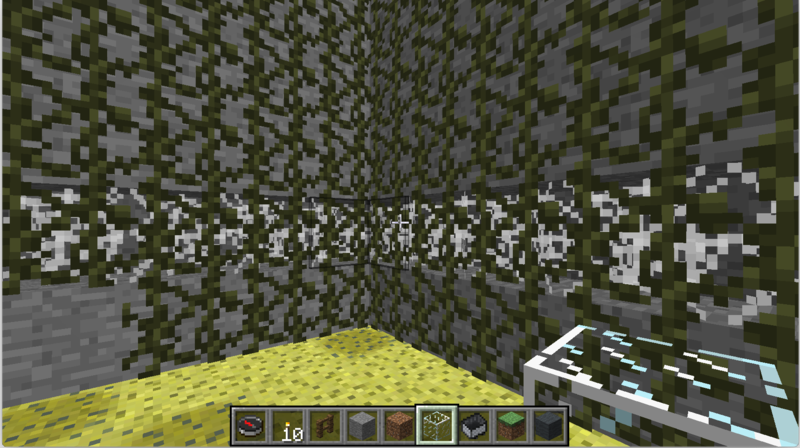 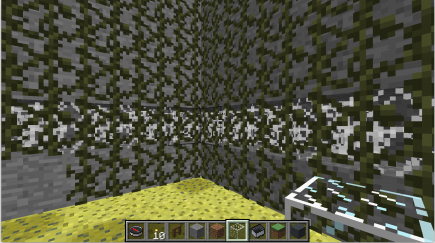 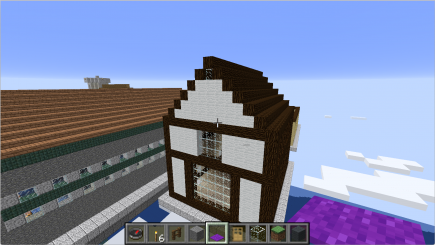 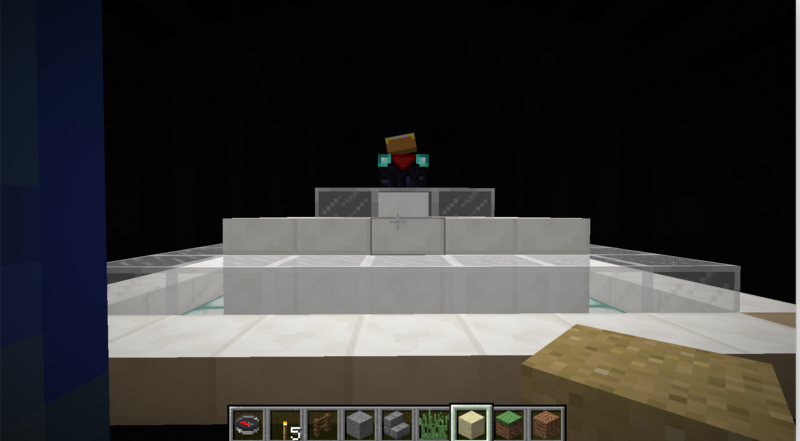 The outside view, with some of the blocks replaced / smoothed out. 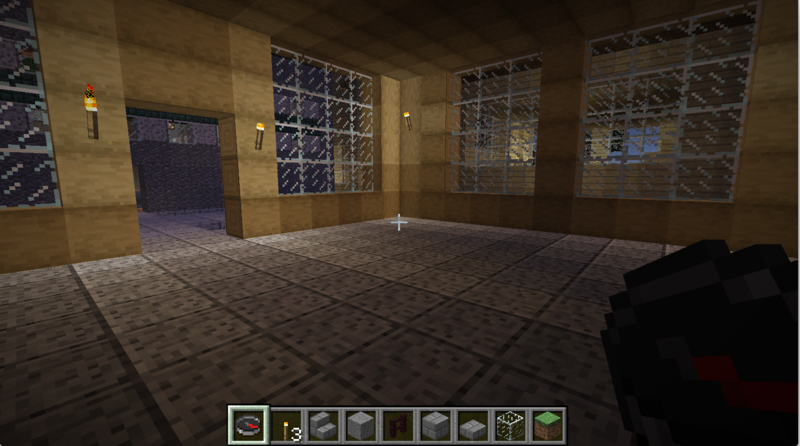 Now we’ve got some windows, lights, and a fence. It’s a little cramped on the inside now, though. 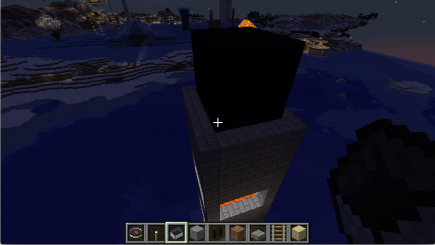 Also, this side looks a little blank. 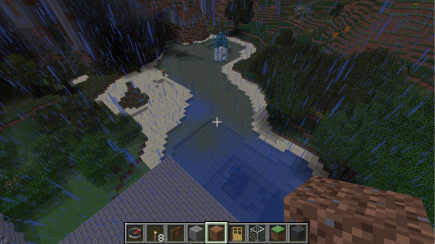 A few more touches, now I like it better. 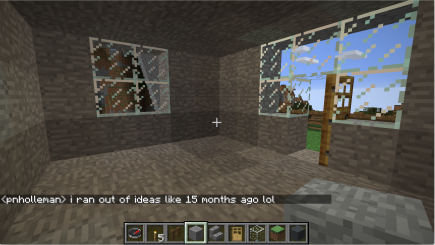 Here’s what it looks like now on the inside, with the side expanded and a second window added. 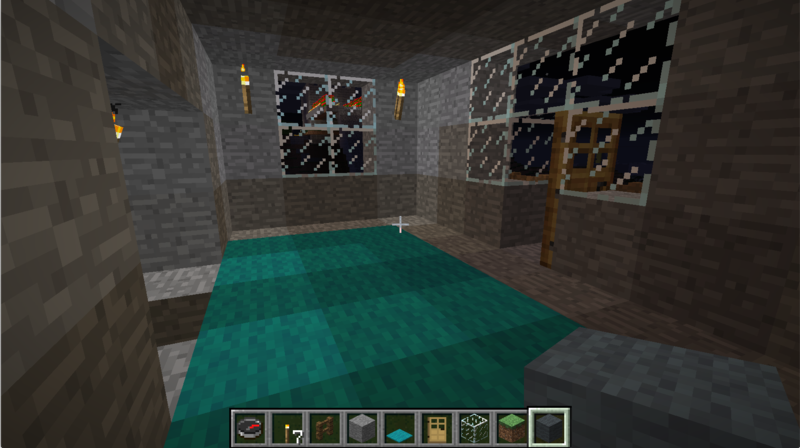 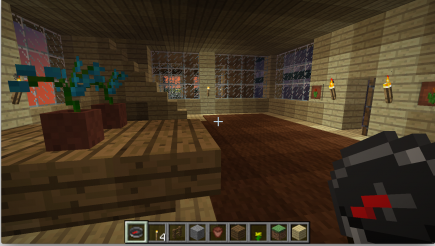 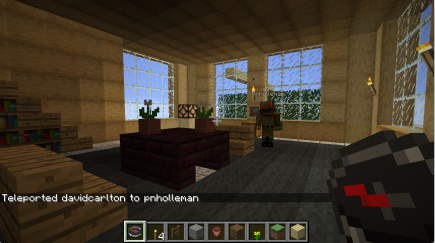 The inside view of the second floor. 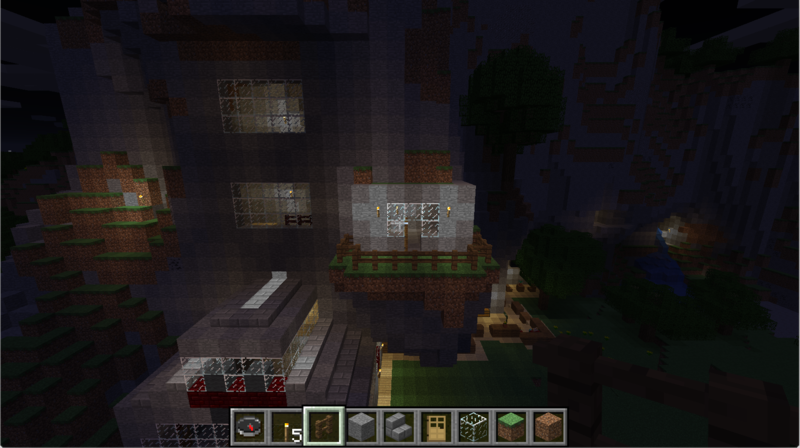 Here’s what it looks like from the side: the second floor is currently set back a block, and also has a shorter balcony. The side window on the second floor. 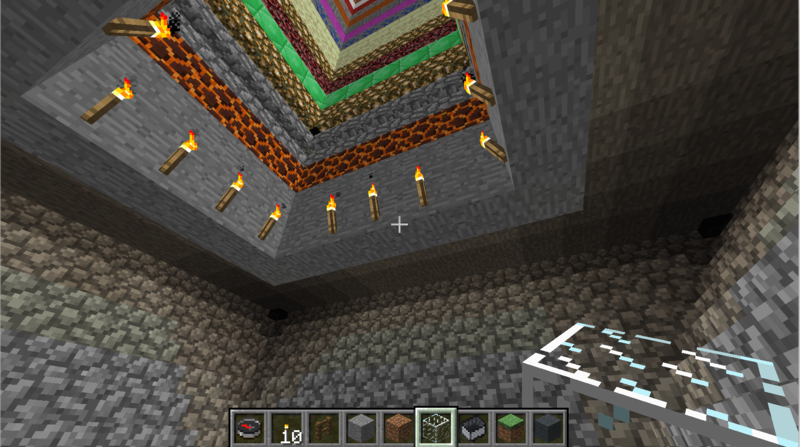 Not up for decorating the inside yet, but let’s at least put in a splash of color. 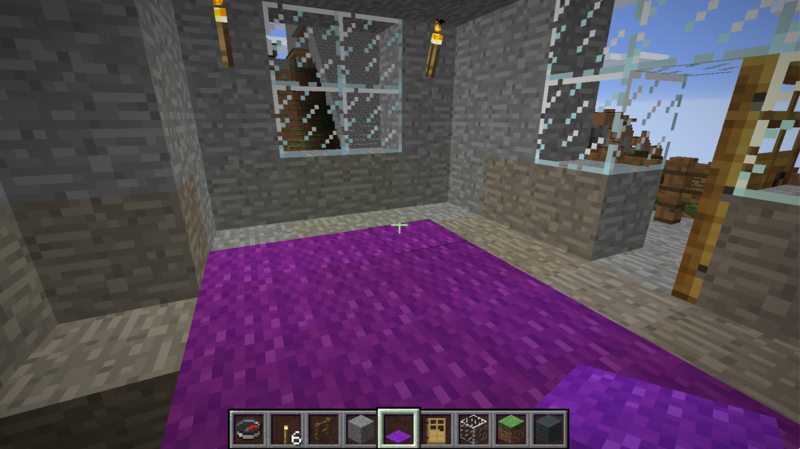 Purple carpet on the second floor. 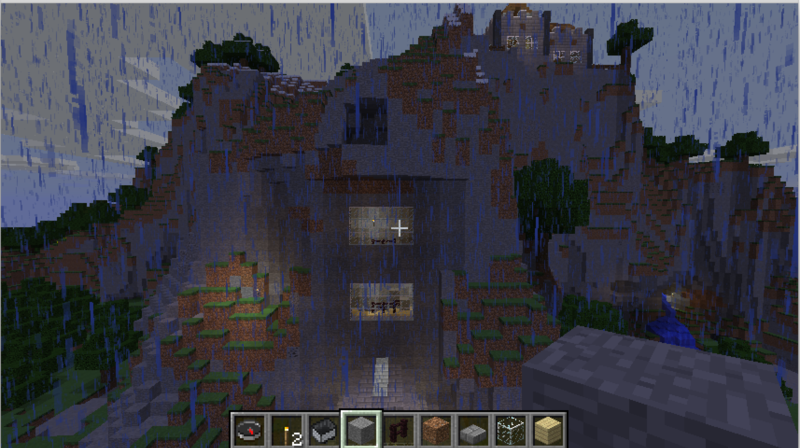 A daytime view of the front. Dan couldn’t make it, and neither could Miranda, but Pat was there; in addition, his wife (I’m blanking on her name, maybe Emily?) also showed up. Here’s the building he was building; and she added some finishing touches to the roof of one of the existing ones. The inside of Pat’s latest building. Another angle on the inside. Here’s the outside view of the front door. 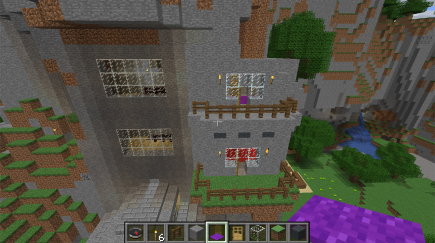 And here’s the back view from the outside. A slightly wider view; on the right, you can see the roof being worked on. 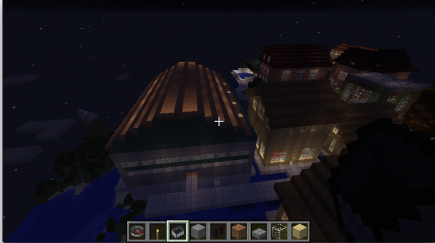 Looking across the roof to more of the city. 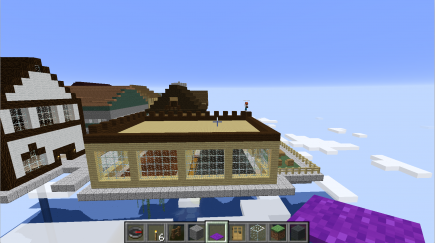 The finished roof, and the back garden. First, the usual wandering around deciding what I want to do next. 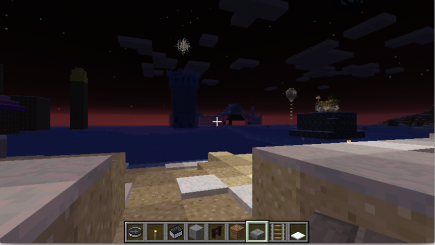 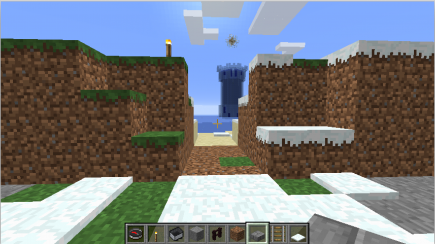 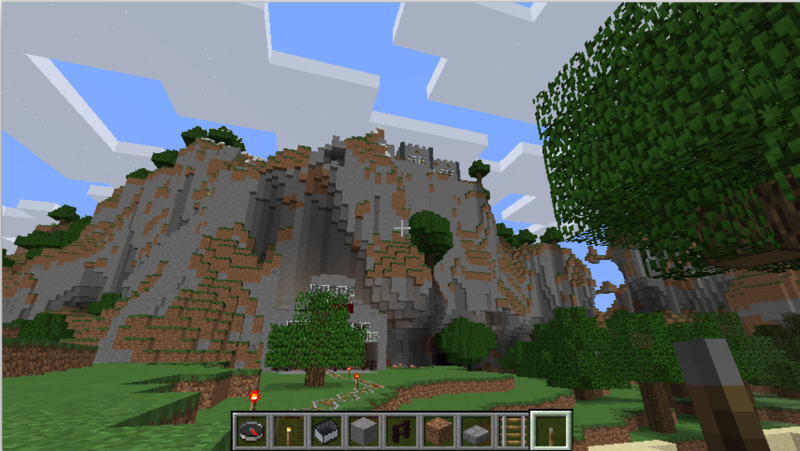 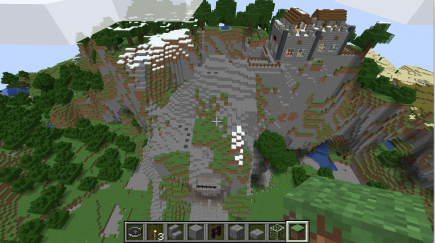 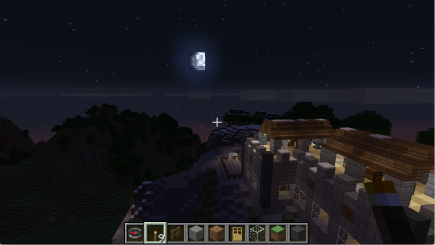 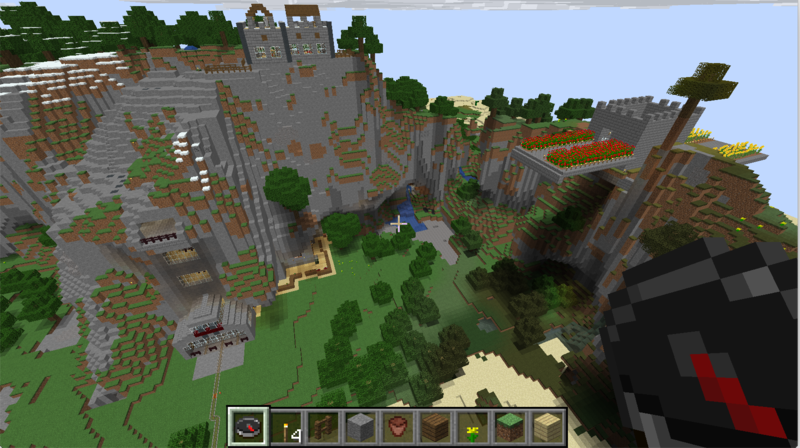 Looking at my mountain and Dan’s castle. Dan is building some stairs down to the ground. 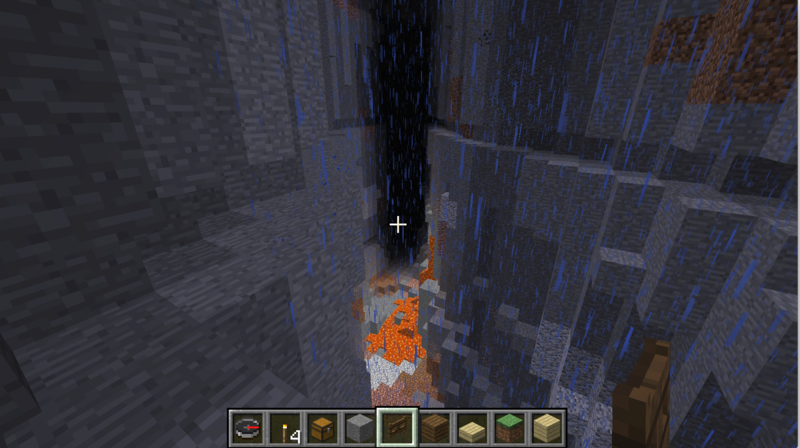 I think I’ll do something inside the mountain next. 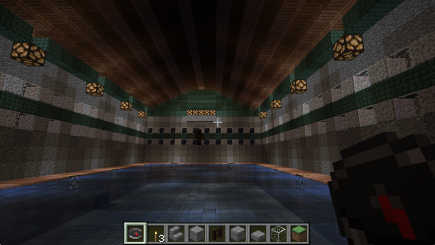 Here’s the other side of the pool. And a view of the waterfall and stairs, just for context. 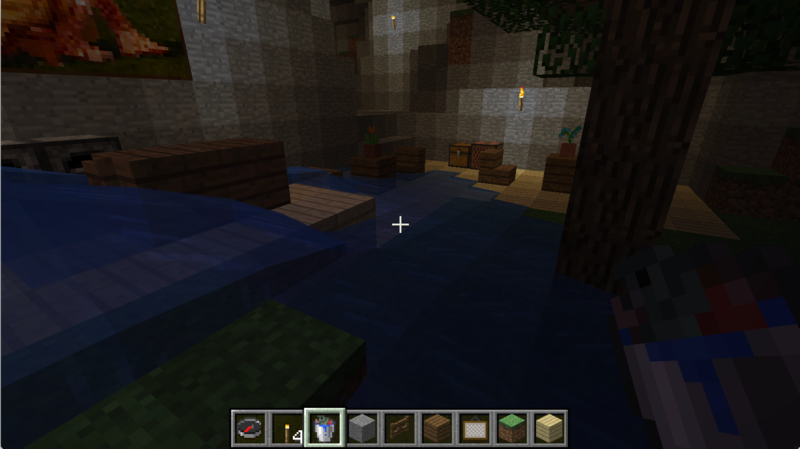 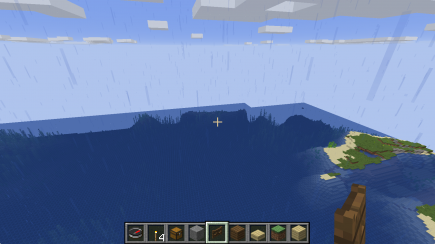 I’d initially been thinking that I’d put some shops in this area, and I still might do that for part of the area, but for the next bit I decided to be inspired by the water and dirt and make the area around the water feel a little bit like a beach. 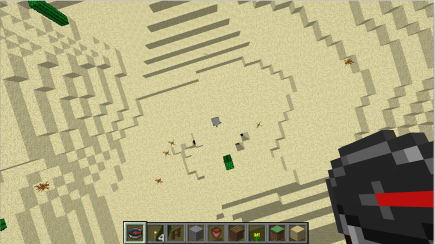 Putting some sand near the water. 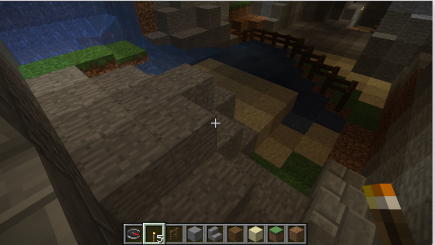 Sand next to the water on the other side, too; what do I want to do about the stone? 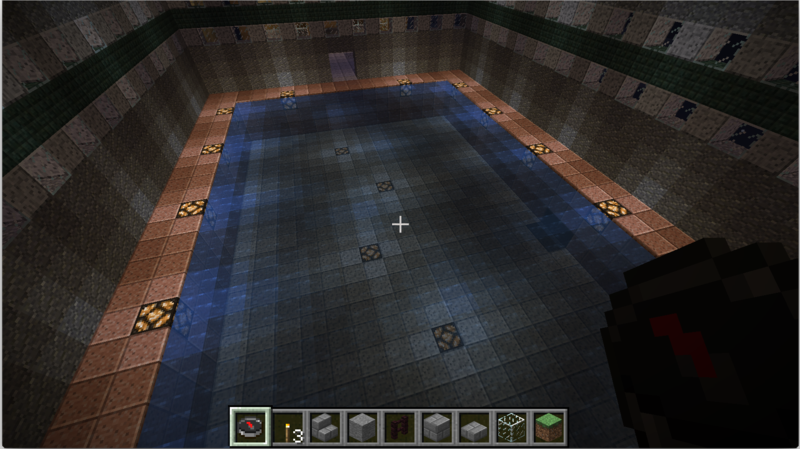 Here’s a top down view of the whole pool area. 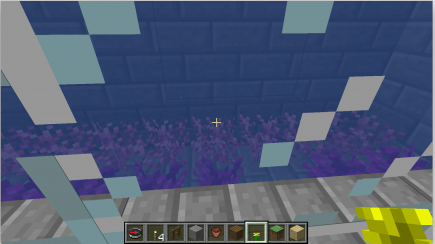 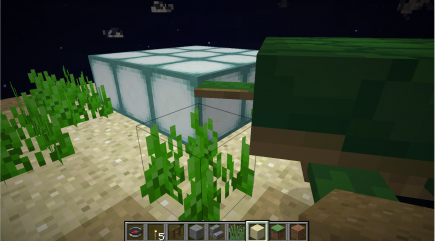 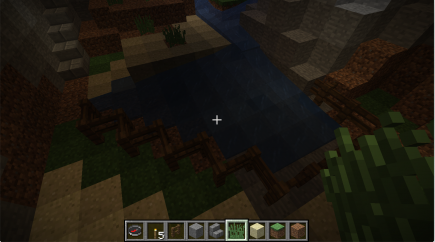 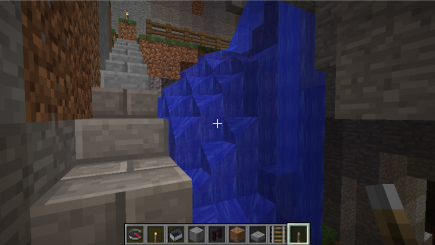 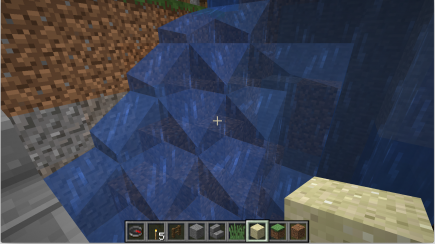 And here’s how the water, sand, and stairs fit together. So that’s me. 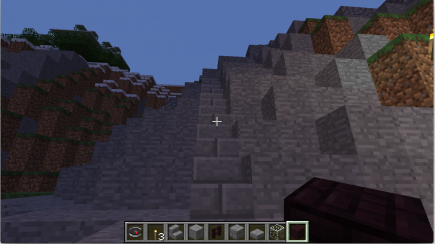 Meanwhile, Dan was building a wide set of stairs down to a plaza; I’ll have to talk to him next time about how he wants to integrate that with my mountain. 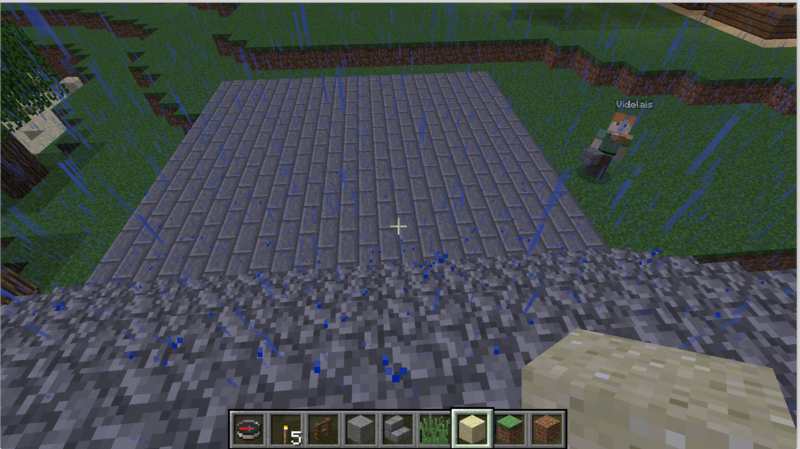 The builder gazes up at his work. How do we want to relate the platform at the base to the nearby construction? A glowing box in the water. 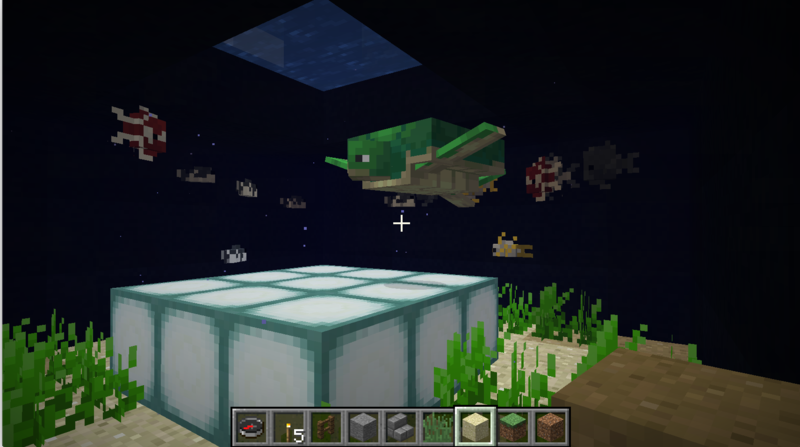 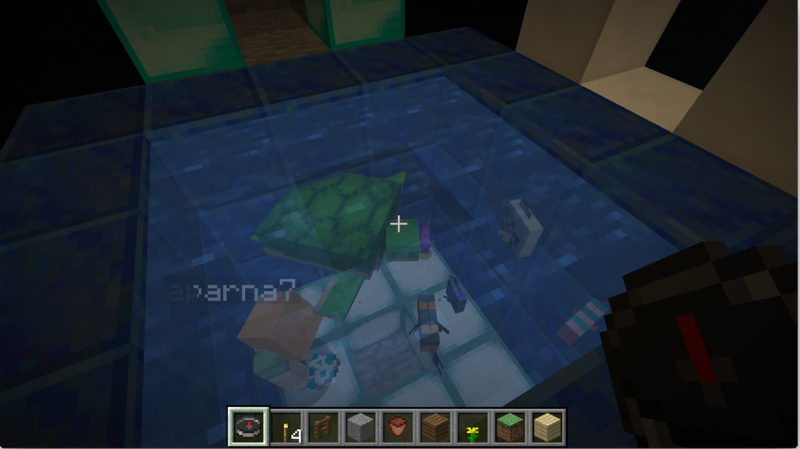 Turtles and fish swim above the box. One of the adjacent rooms is now white instead of gold. 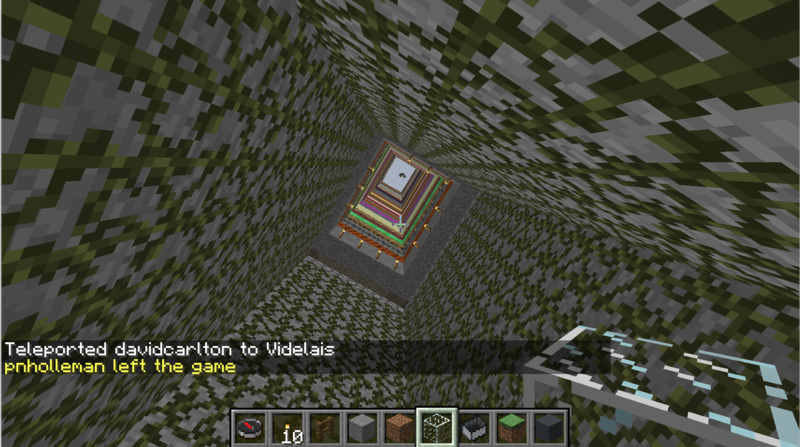 A view of the white pedestal from above. 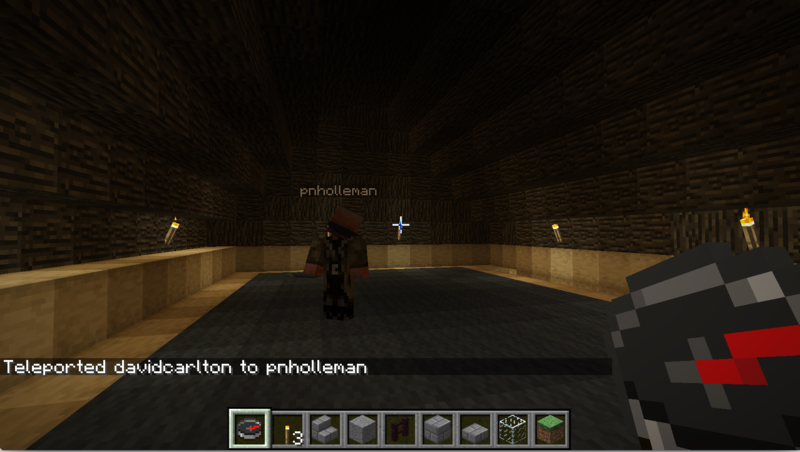 And, finally, I caught Pat when he had finished the shell of a building but was working on finishing it. The outside of the building. Adding some lights certainly helps. 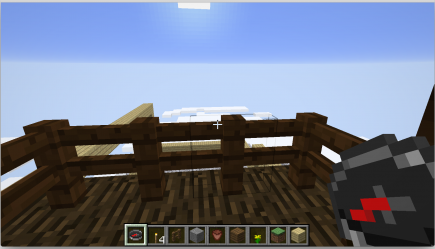 Adding some grass to the back balcony. 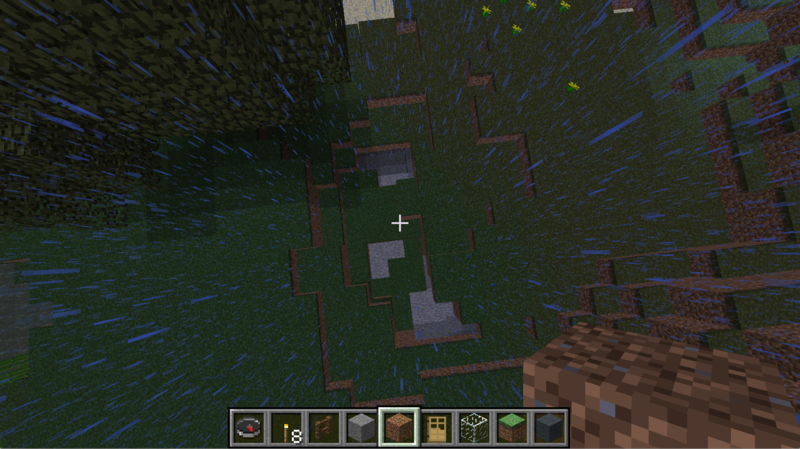 First, the stuff that I did. The idea is to extend the shopping area from the train station to the entrance into the middle of the mountain. 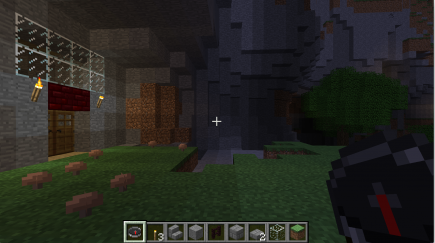 I’m going to continue along that wall, going around the corner towards the dark area. Looking down from the top of the mountain. 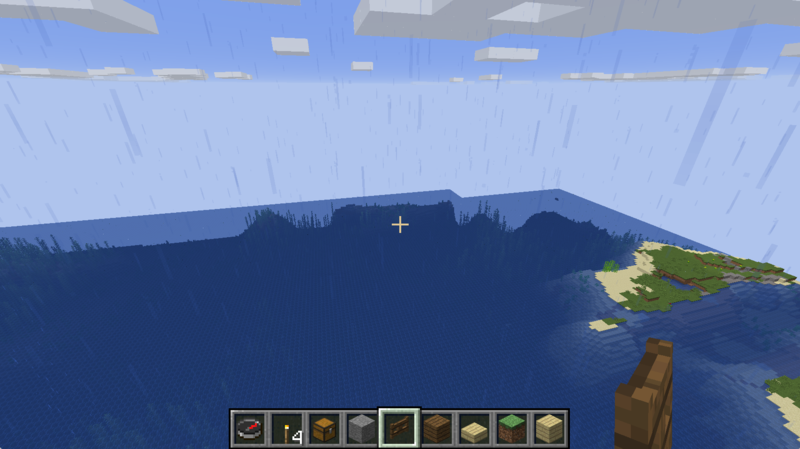 There’s some nice water on the right, I should think about that. 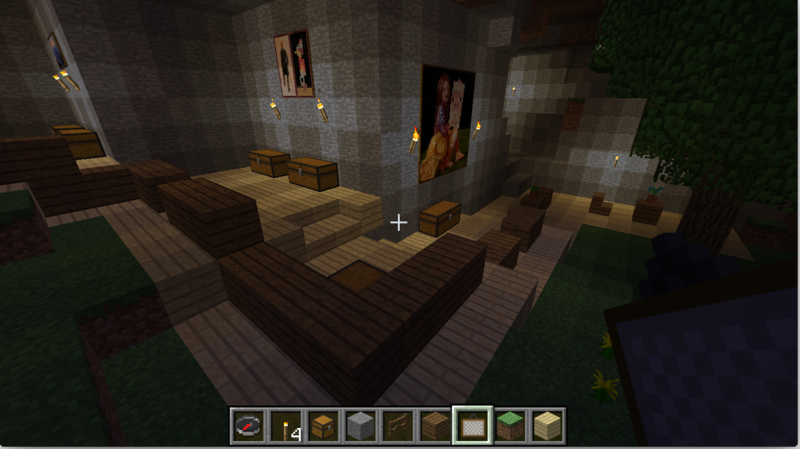 Let’s put in some tables and chairs. 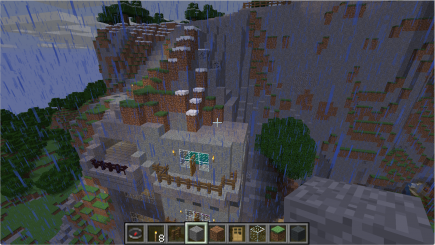 In the back corner you can see the stairs that lead into the mountain. 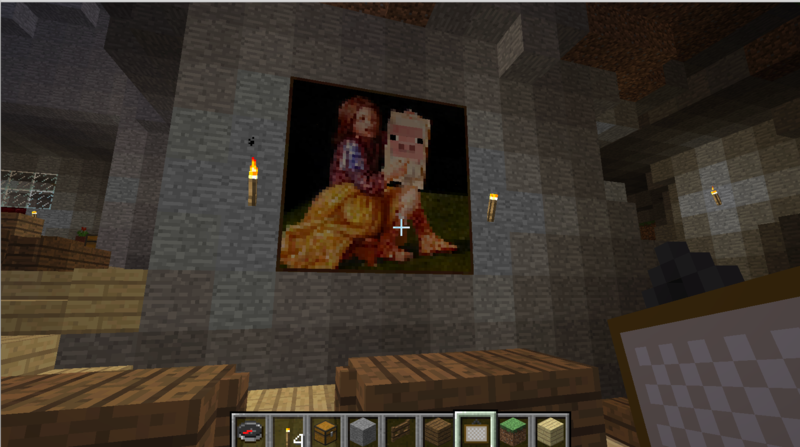 Putting a picture on the wall. 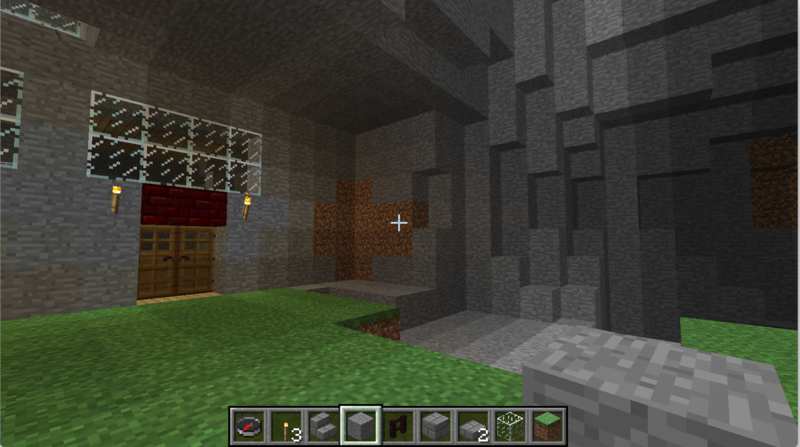 A view from the corner. 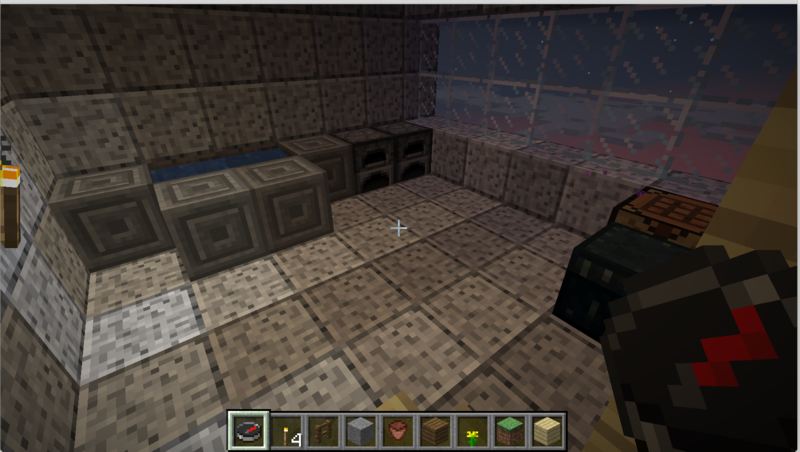 Let’s replace the chest with stoves, maybe this can be a cafe. Now it’s dry again, and there’s a bit more decoration. That’s what I did; Dan next. 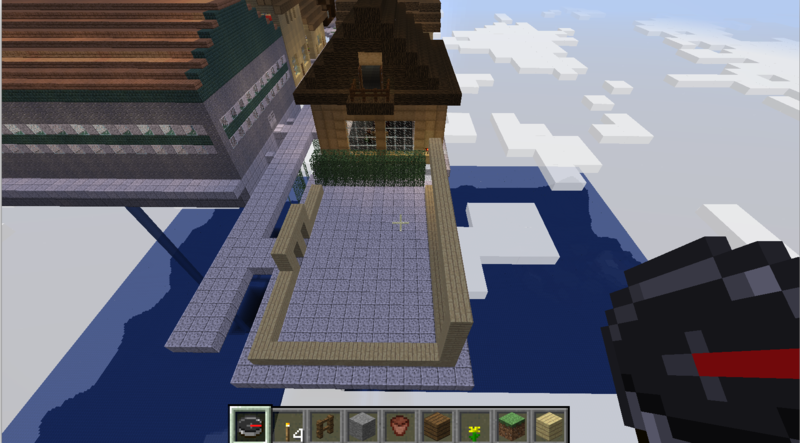 Flying over to visit my neighbor. 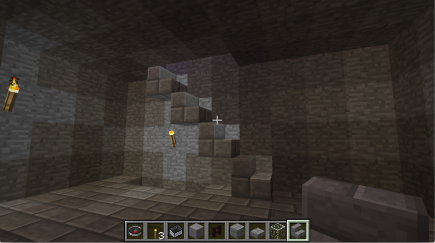 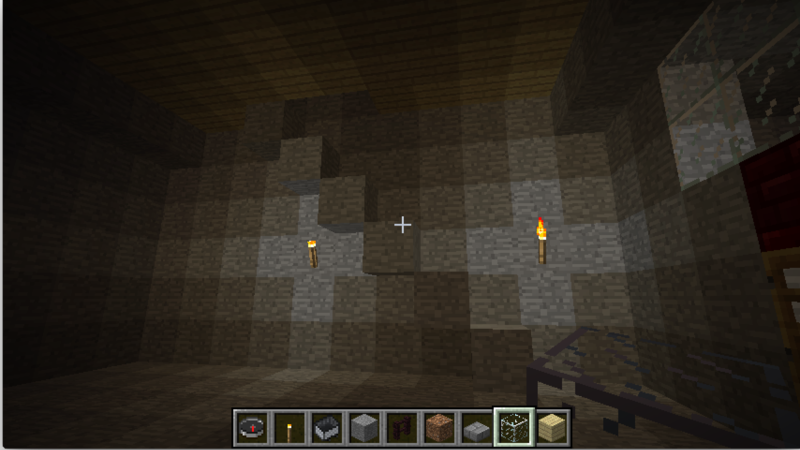 Torches and stairs inside the castle. 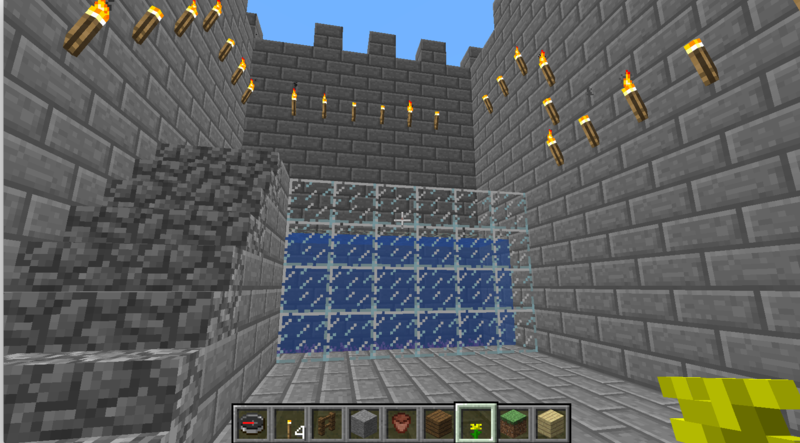 Some water behind the glass. 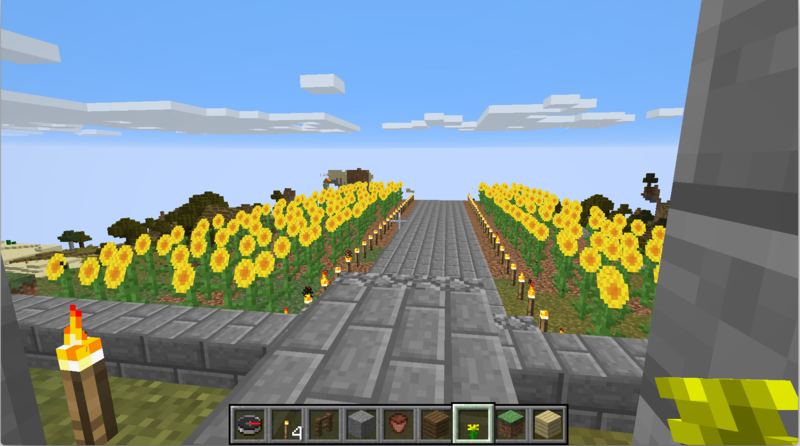 A field of sunflowers out back. 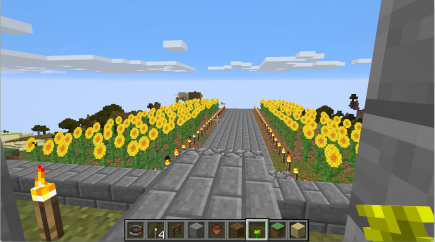 The sunflowers are completely green from the back. There’s a moat that extends around the side. A closeup of some underwater plants. Building a path with red flowers on the other side. 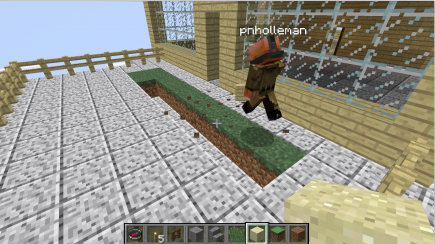 An exciting action shot of the flower planting. Now there are flowers on both sides of the path. She’s added a watery pit. Sea creatures in the water. 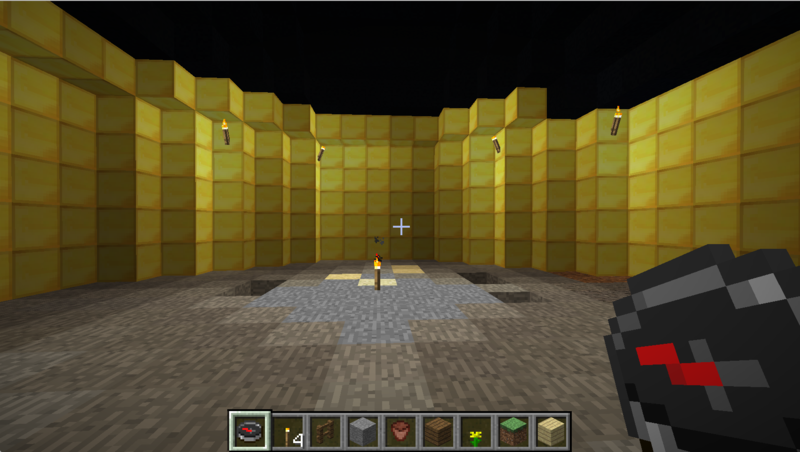 Pretty sure I’ve seen this gold room before. 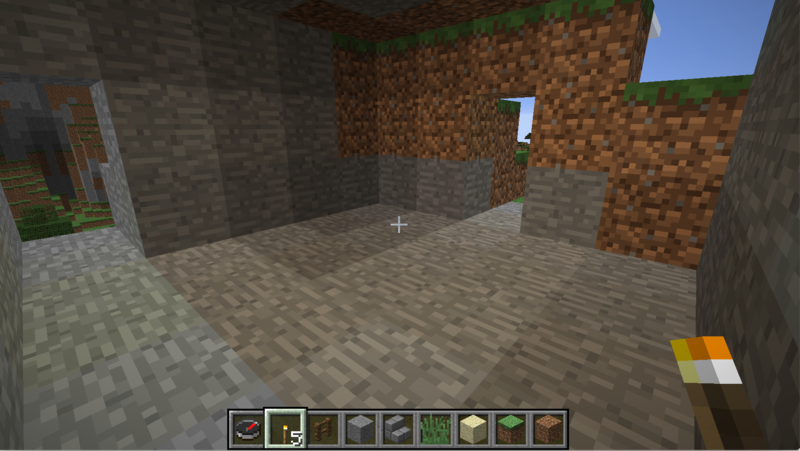 The ground above the tomb. 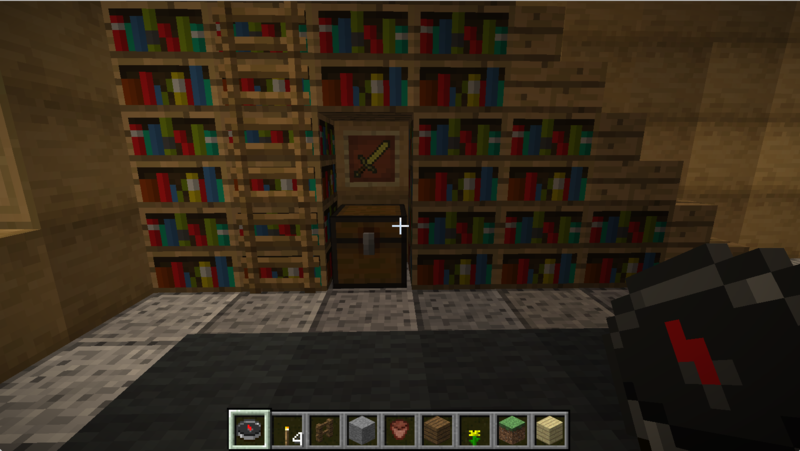 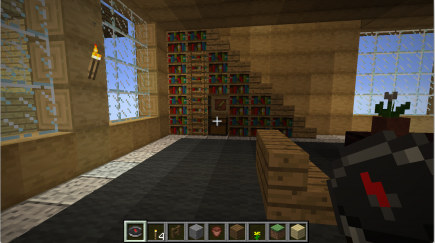 There are books under the stairs. 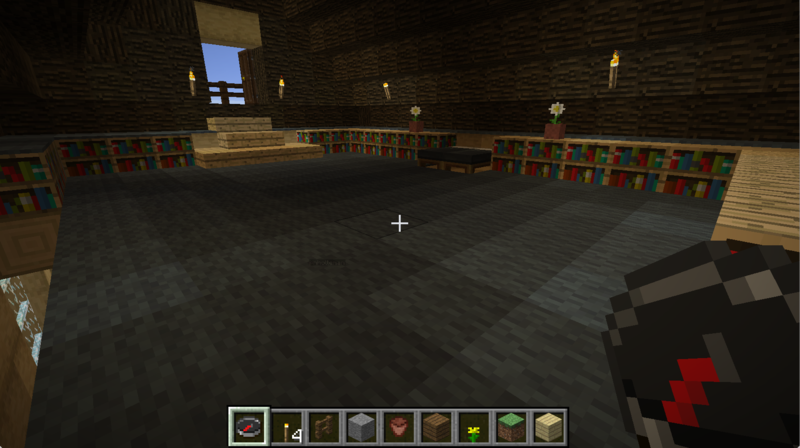 A closeup on the chest nook in the books. 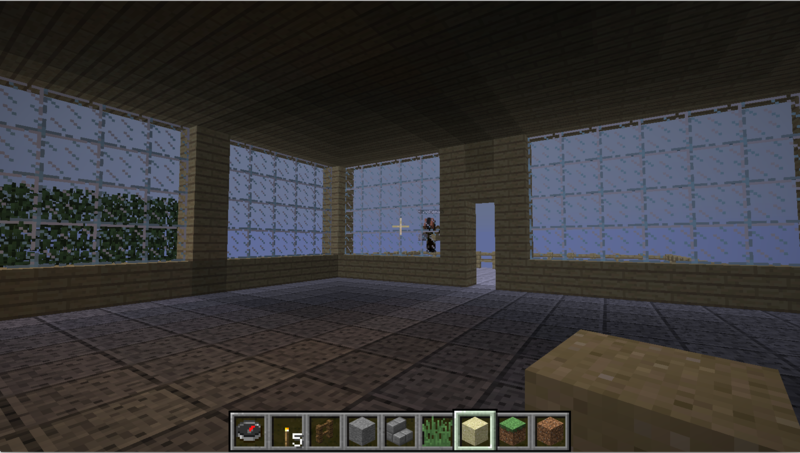 Looking out the window at the start of his next project. 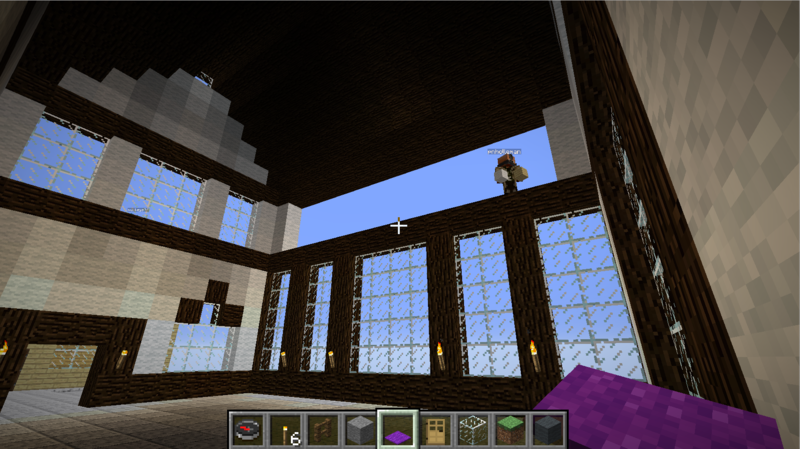 The second floor continues the book theme. 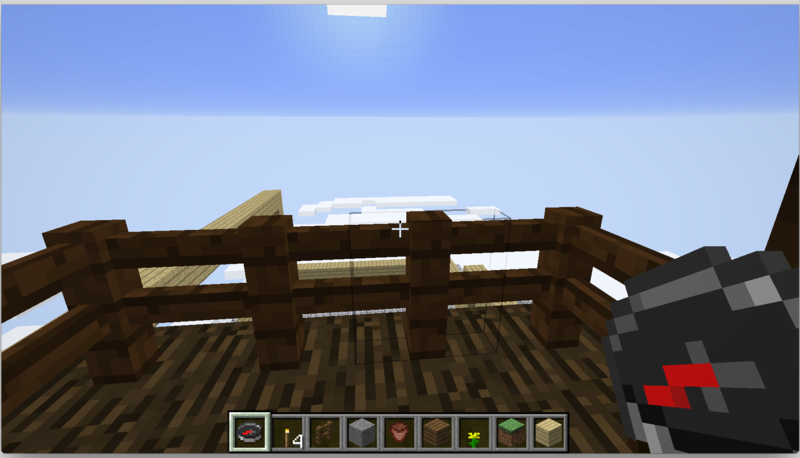 The view from the second floor balcony. 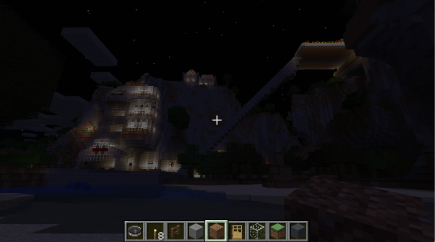 Something in the early stages of construction. 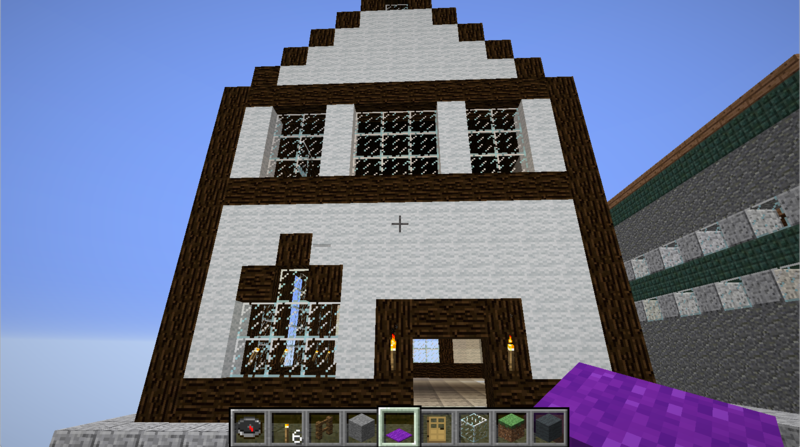 Another house nearby that didn’t look familiar. In this one, there are stairs under the stairs. A light shining up from below. There’s a bathtub in the basement! 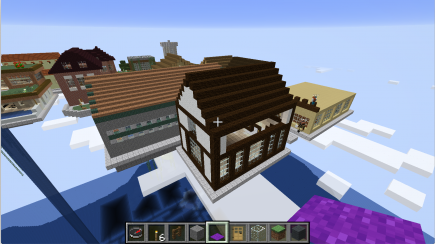 Up on the second floor attic. 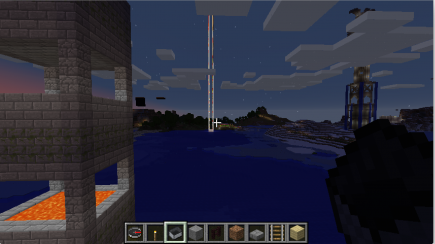 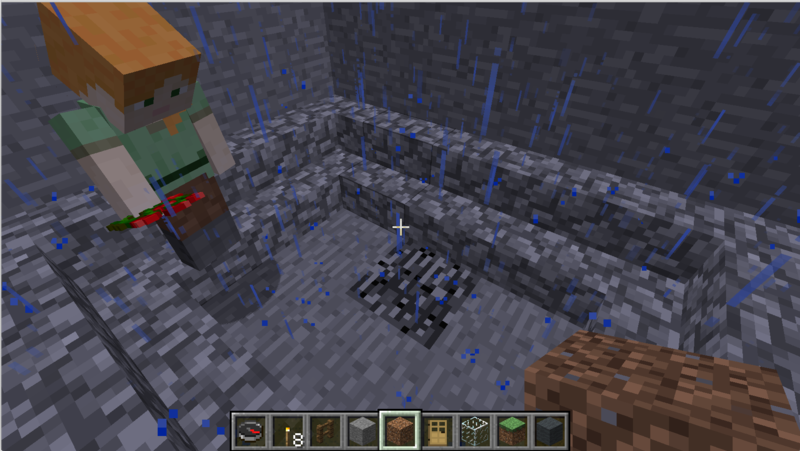 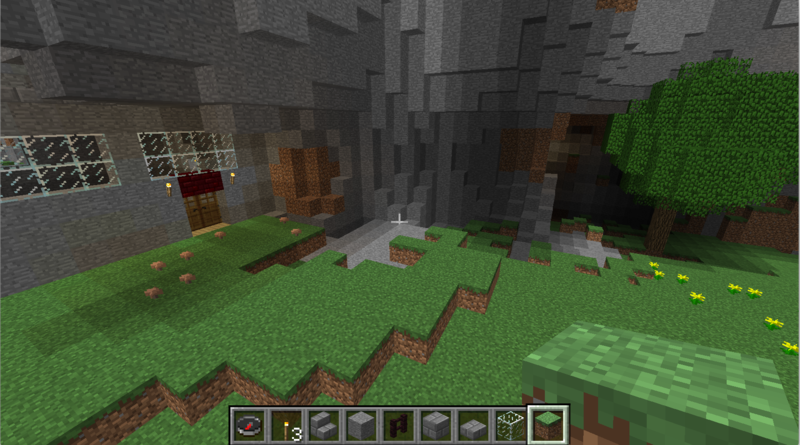 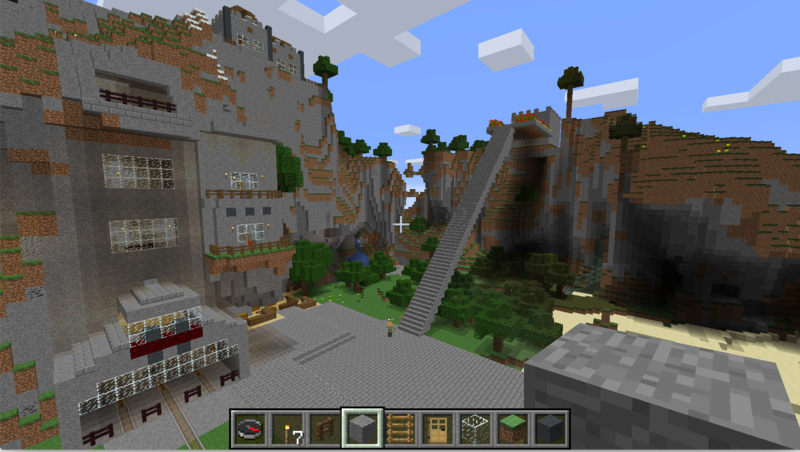 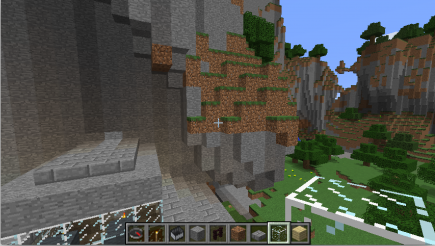 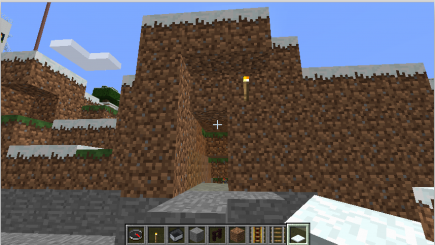 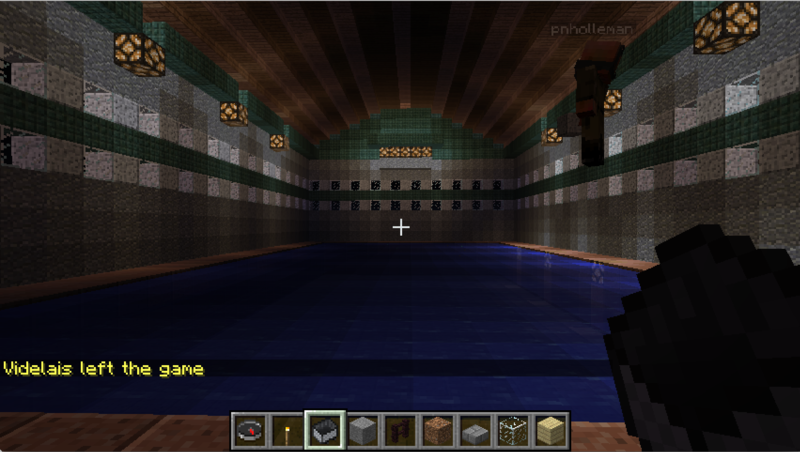 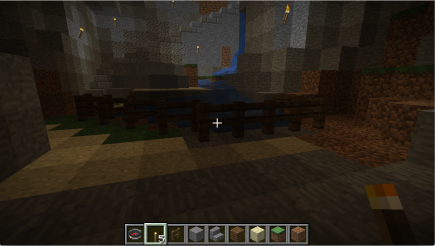 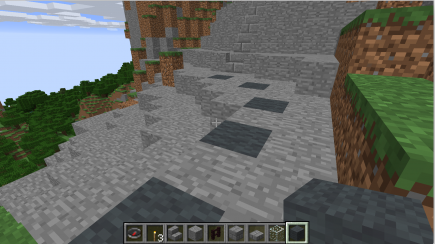 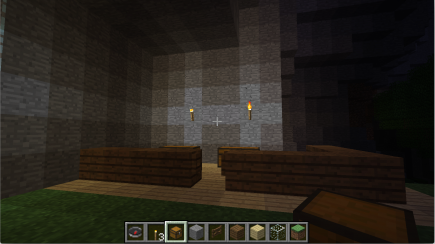 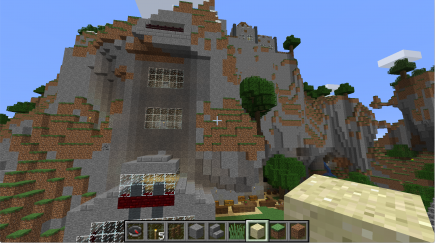 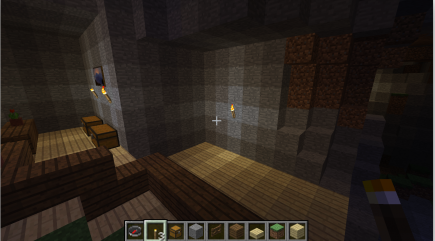 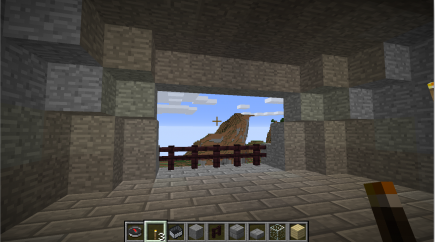 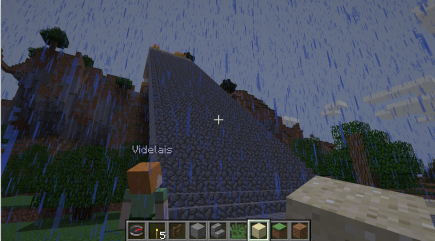 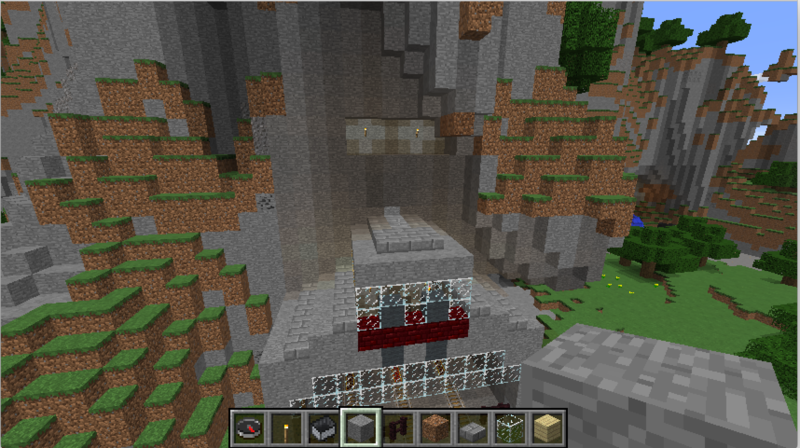 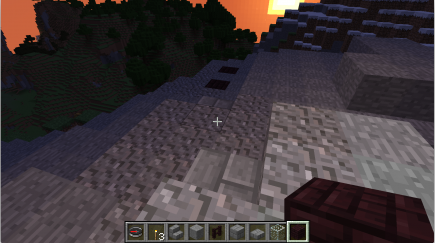 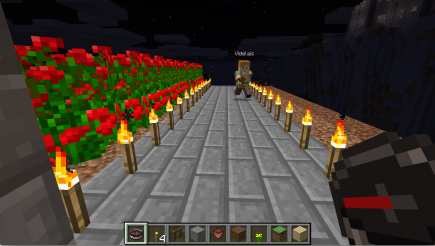 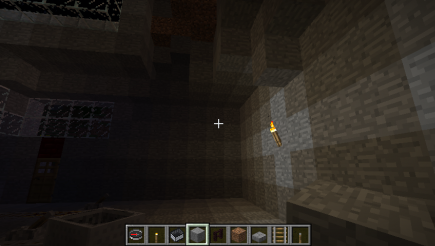 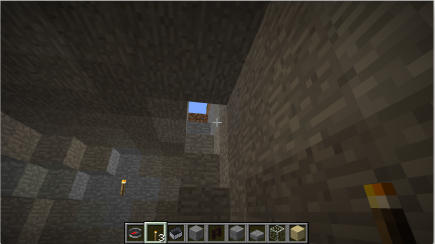 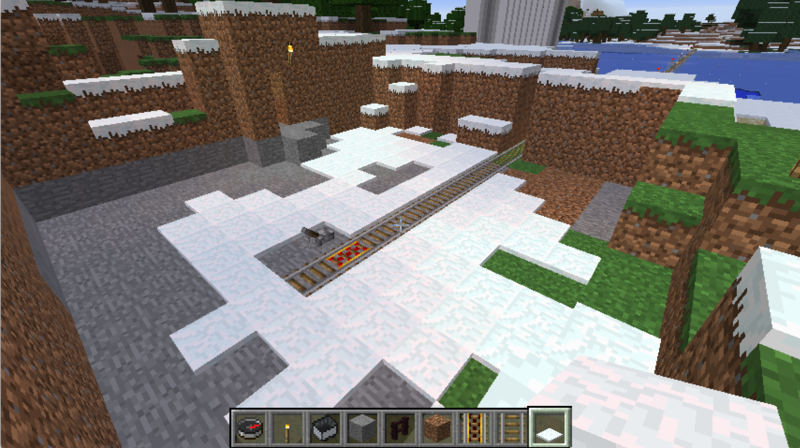 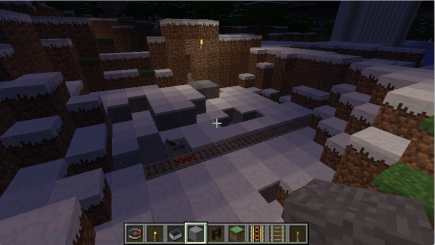 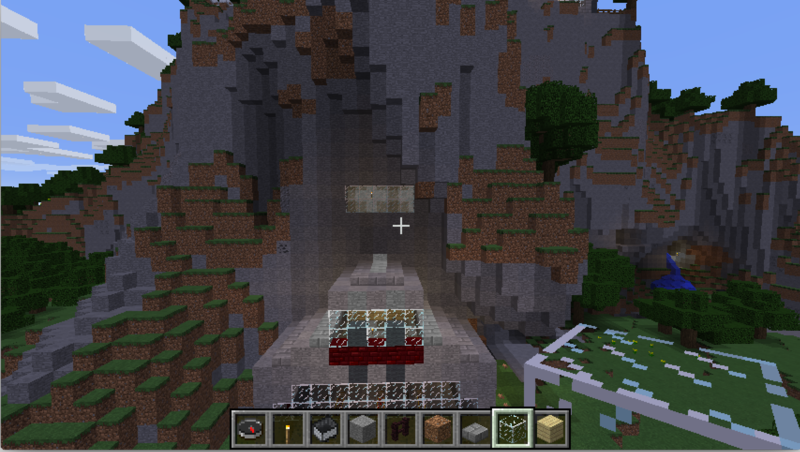 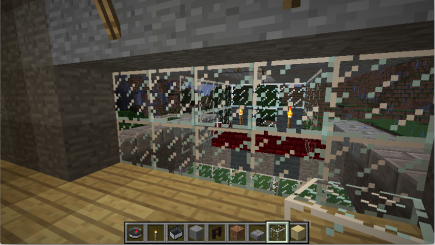 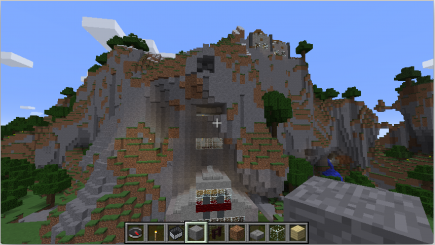 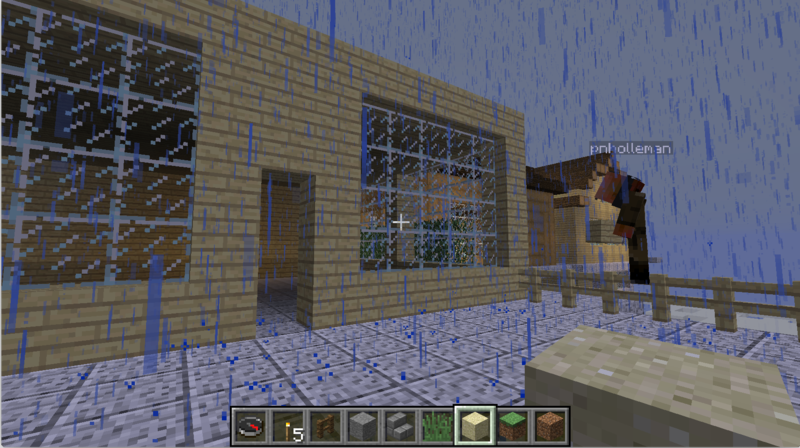 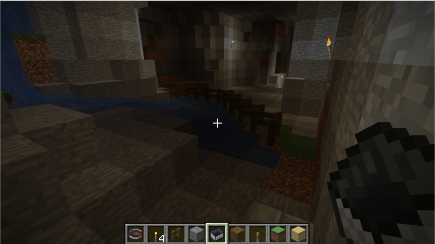 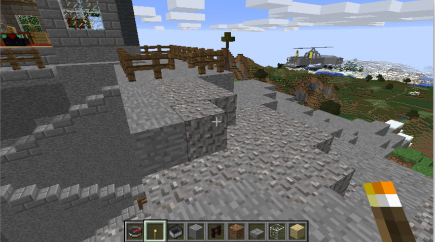 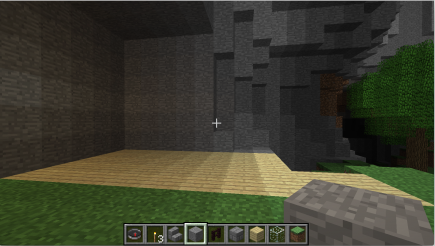 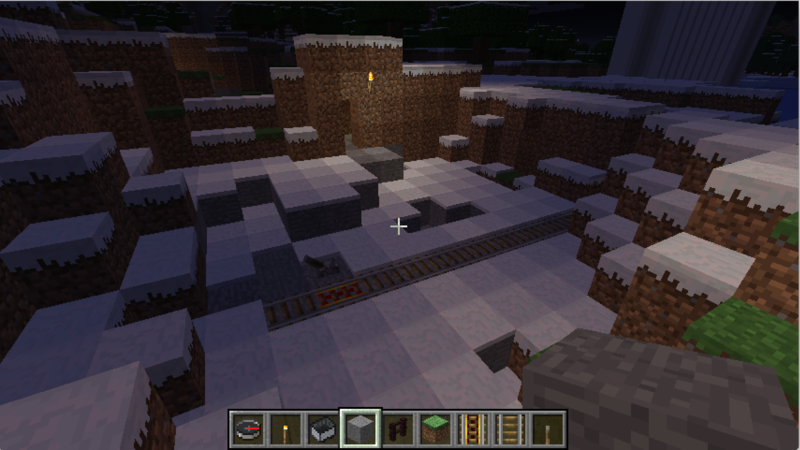 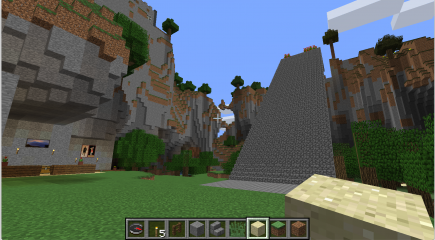 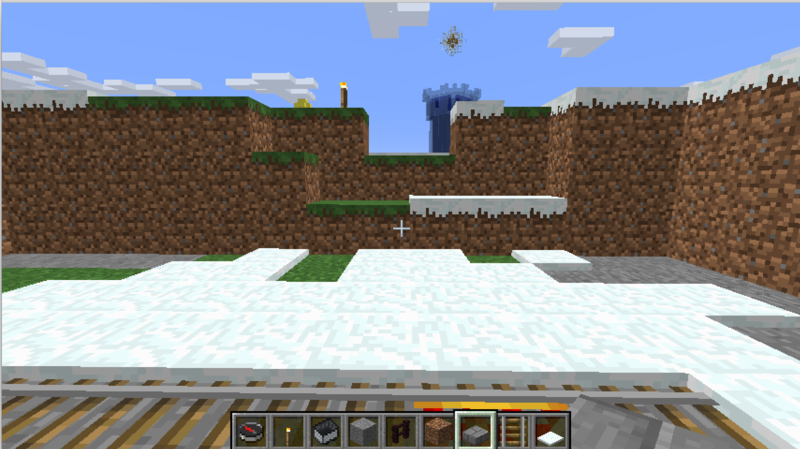 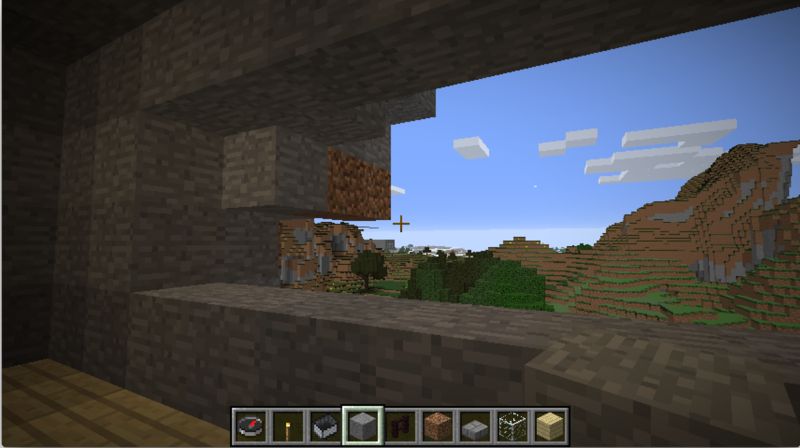 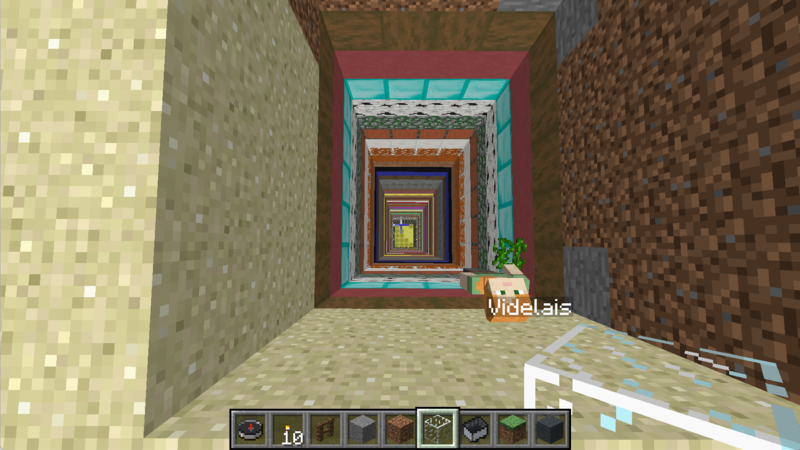 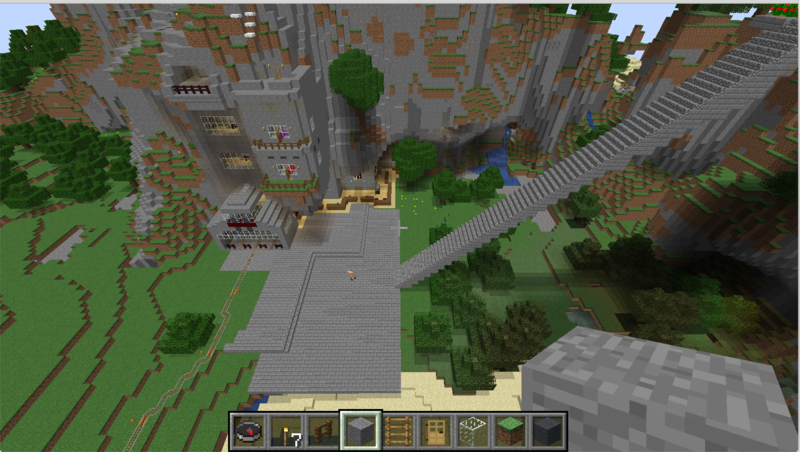 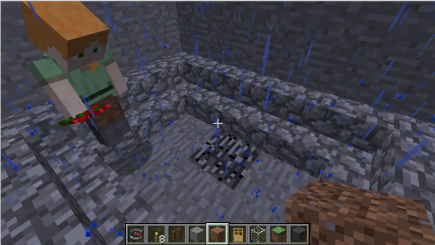 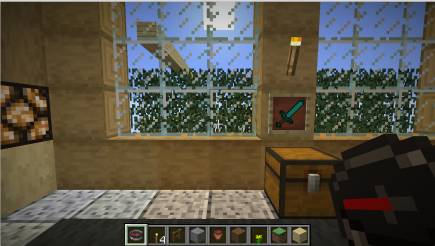 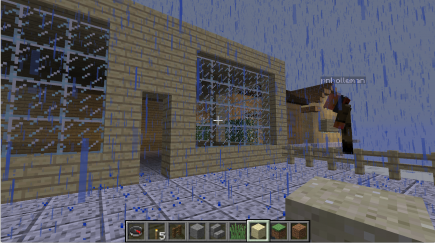 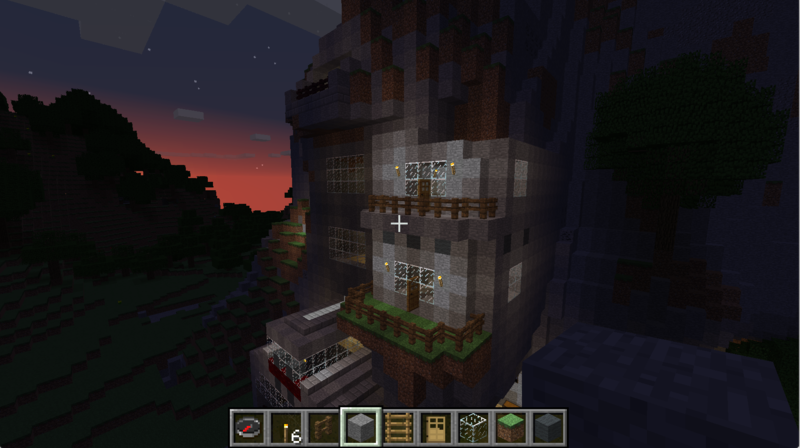 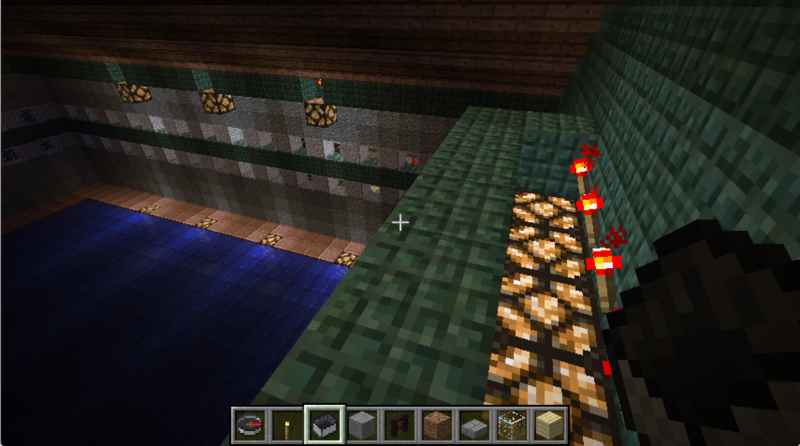 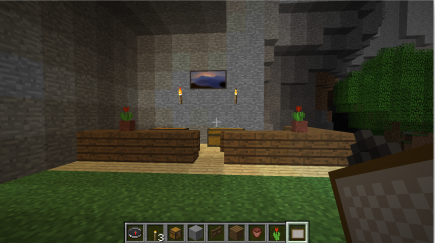 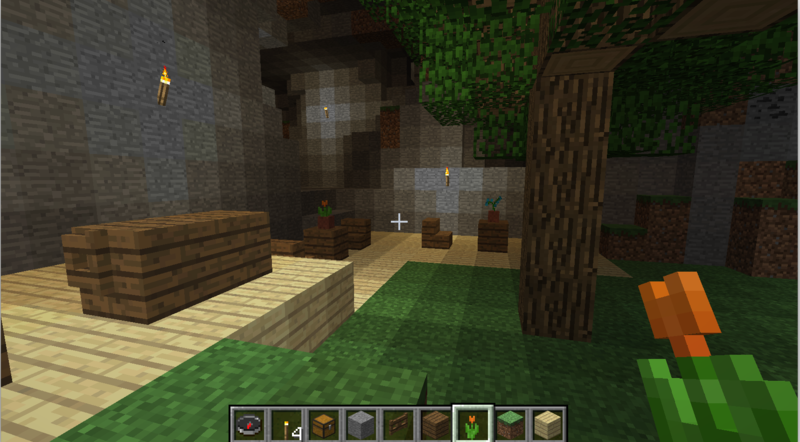 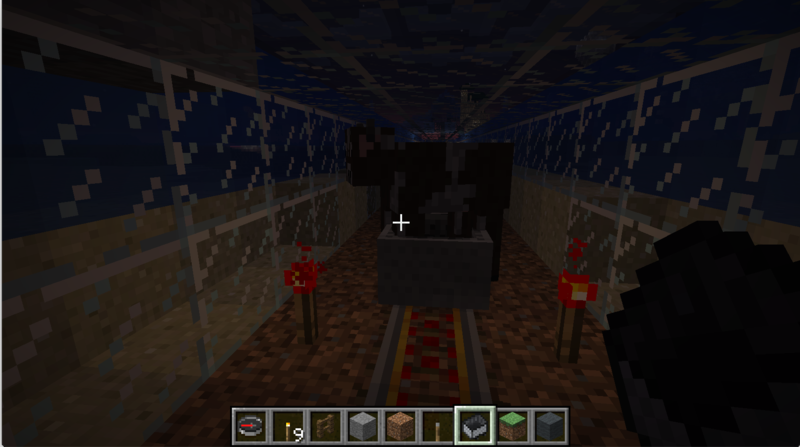 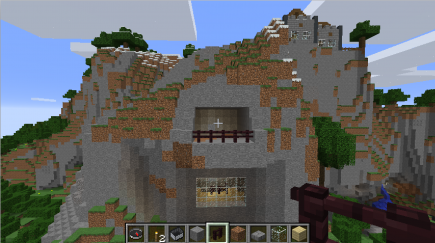 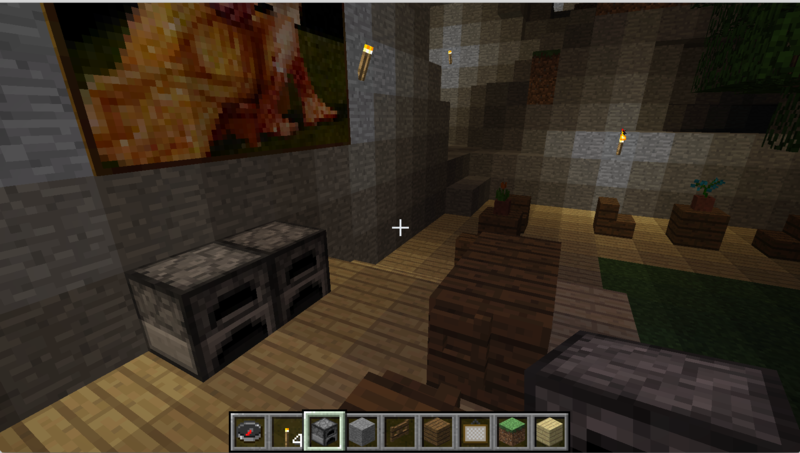 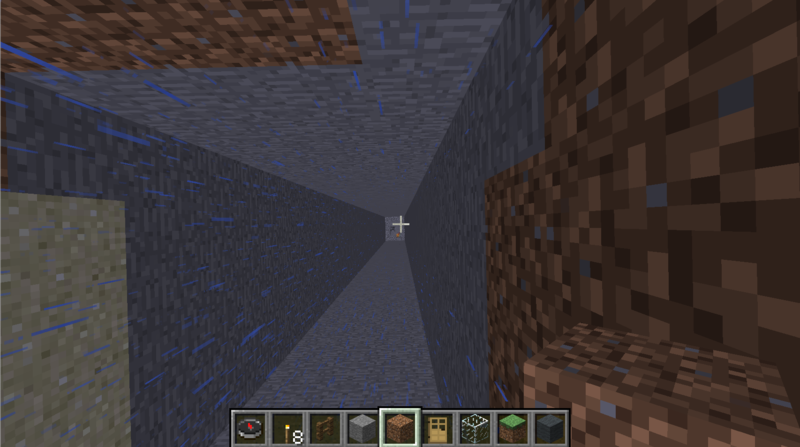 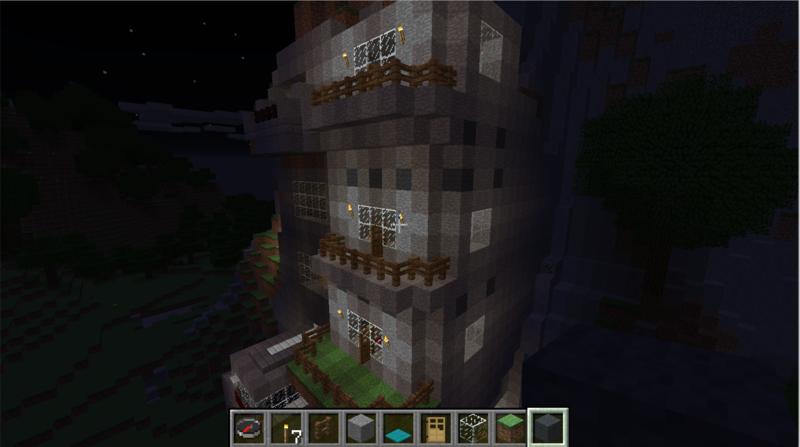 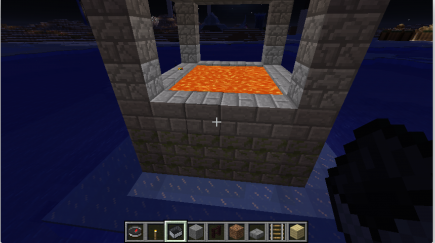 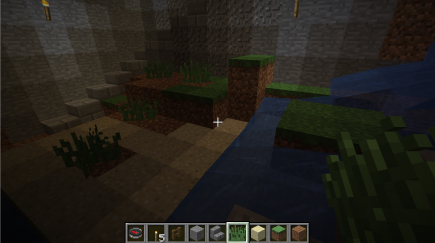 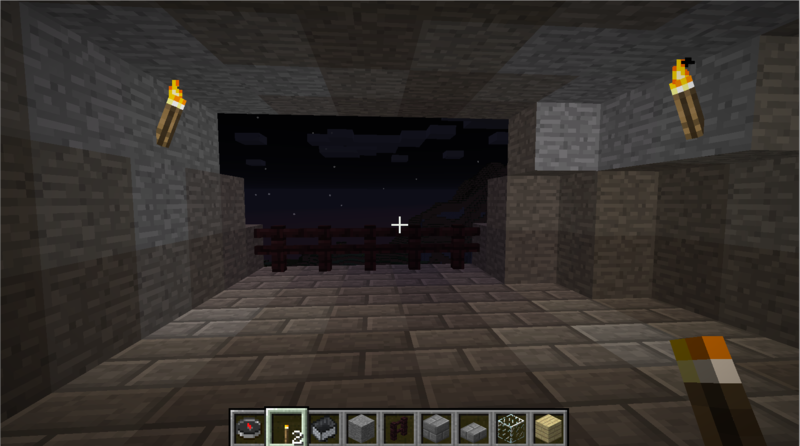 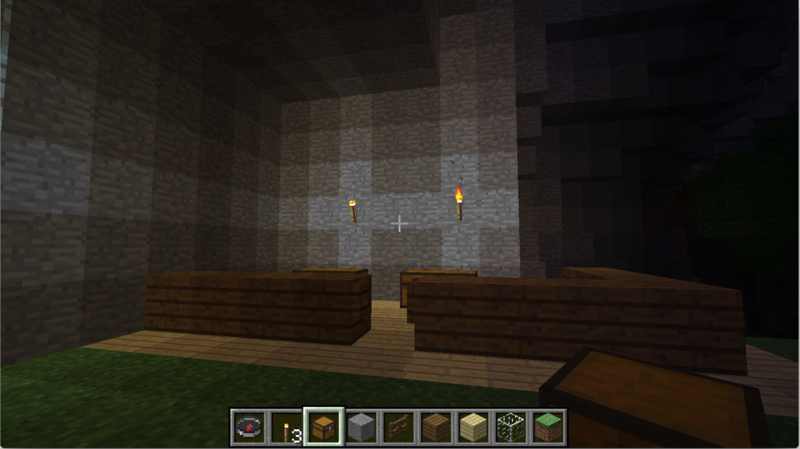 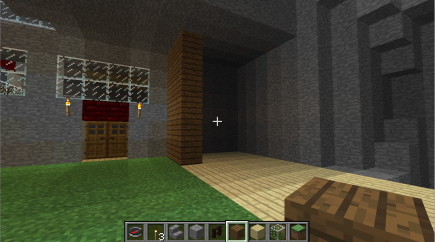 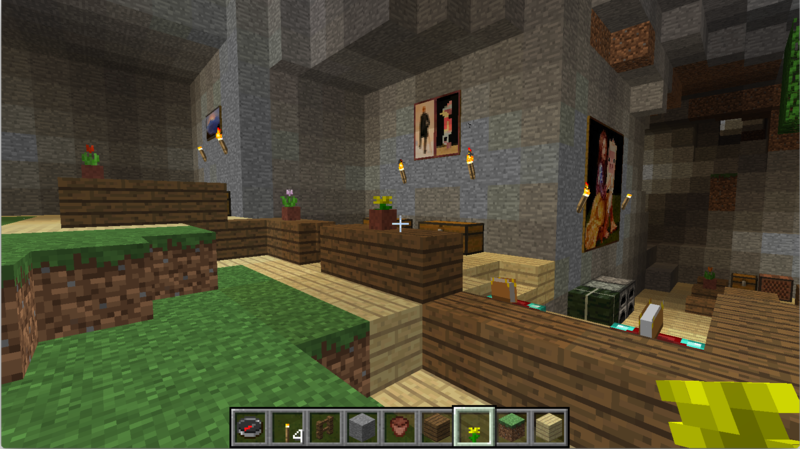 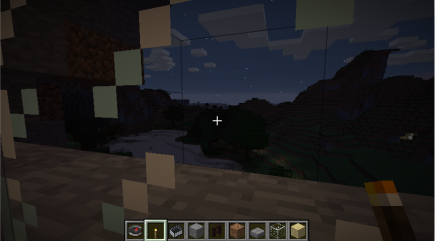 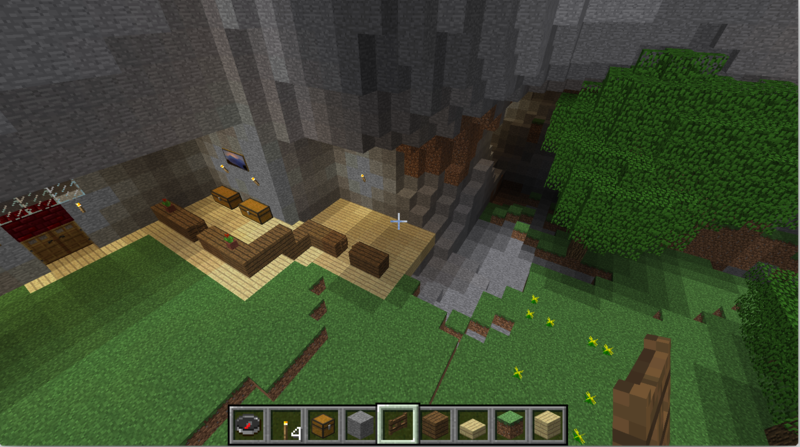 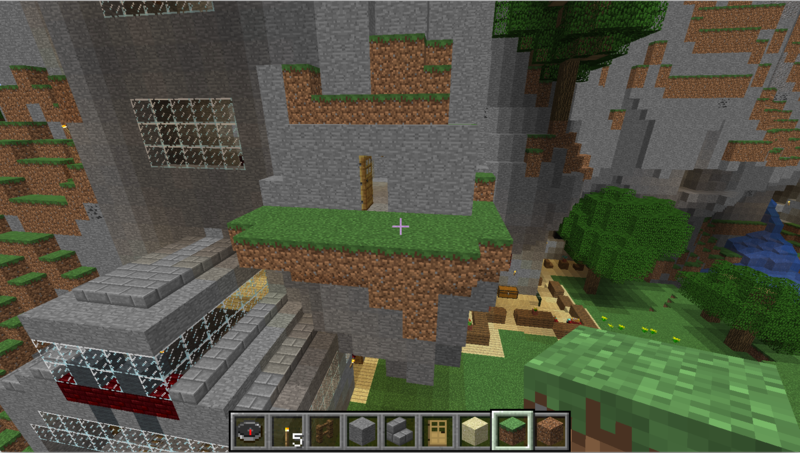 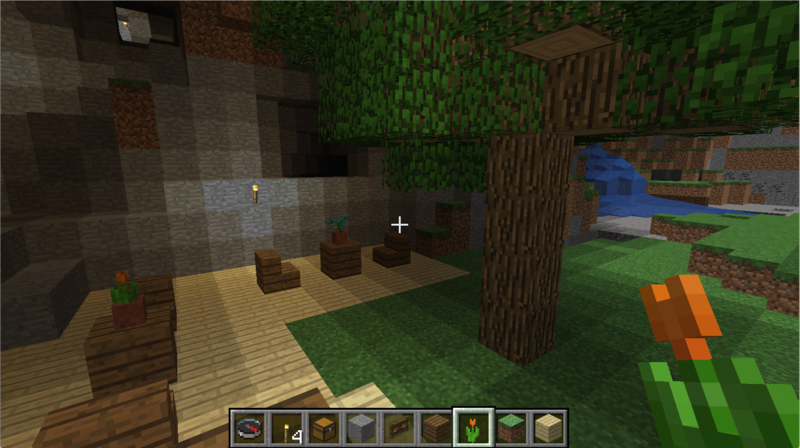 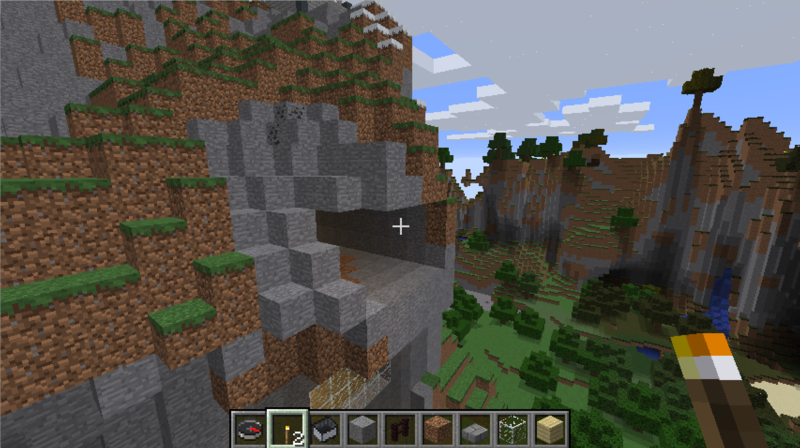 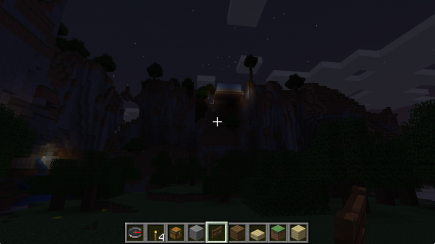 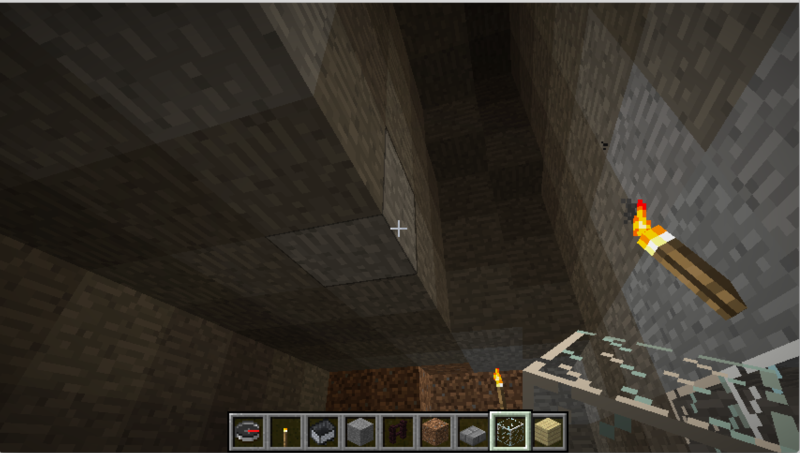 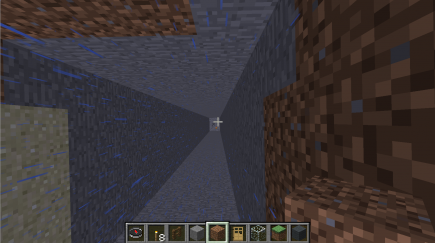 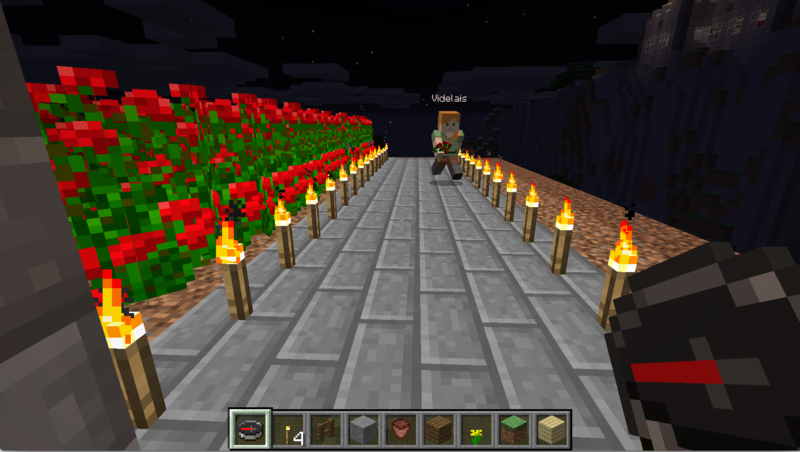 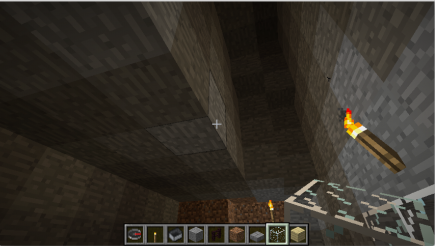 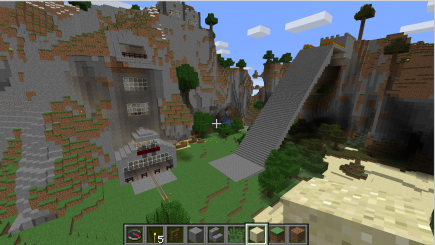 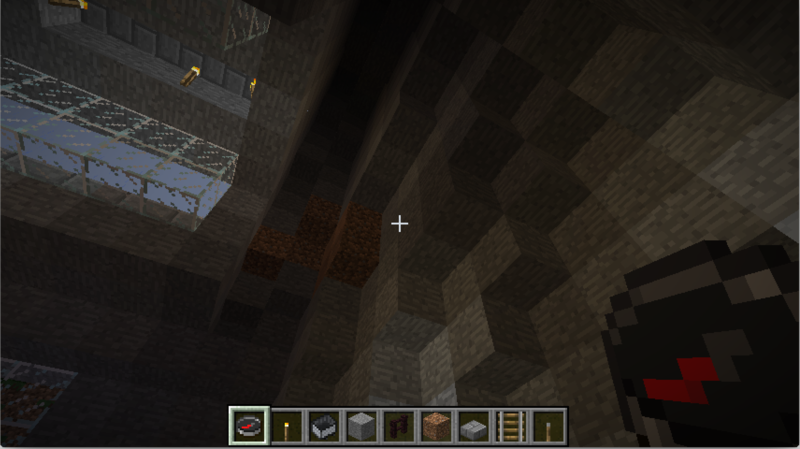 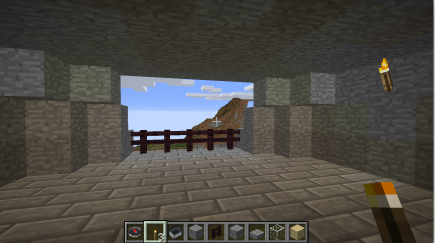 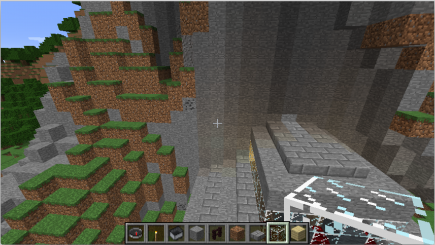 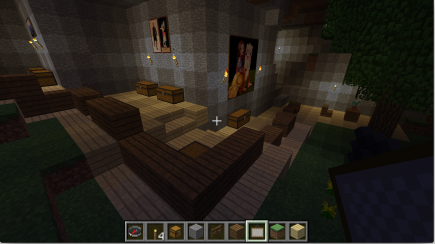 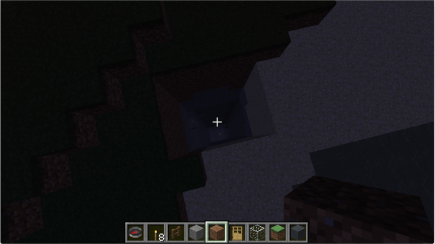 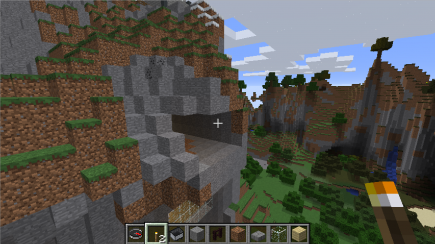 In the August Minecraft session, I wanted to connect the train station to the main entrance through the mountain. I decided that it would make sense to have a row of shops there, so I scoped out the area with that in mind. 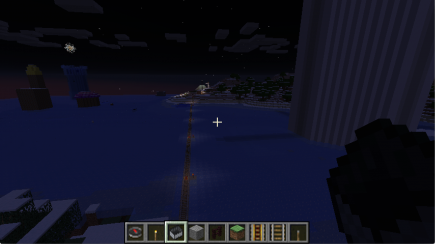 Scoping out the next place I want to build. 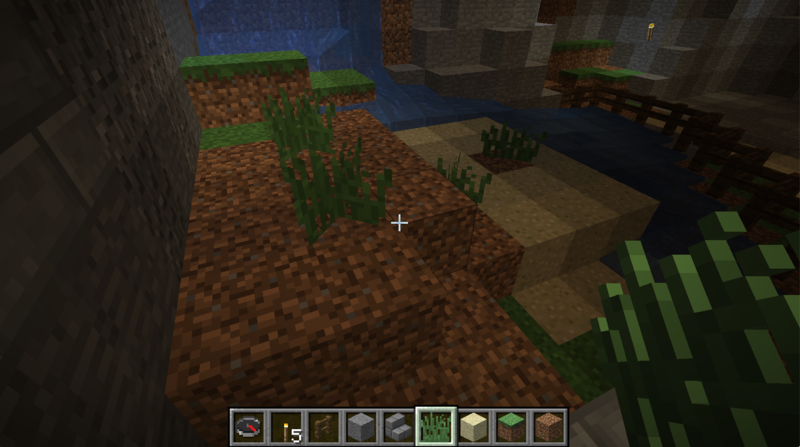 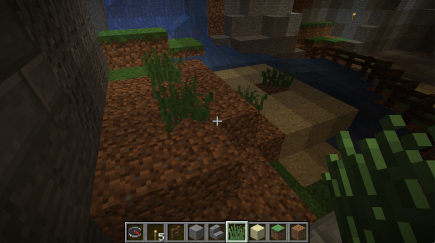 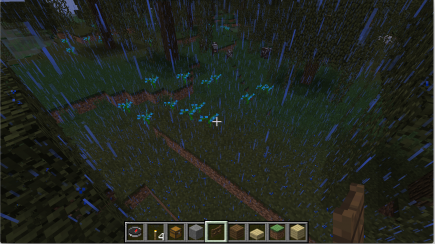 Getting rid of mushrooms, starting to regularize the grass. Making the wall a little deeper (and only stone, no dirt), and starting to put the floor in place. 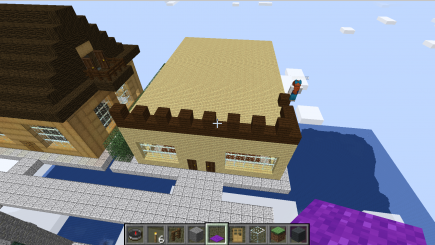 Do I want a wall in front of the store, like a regular building? 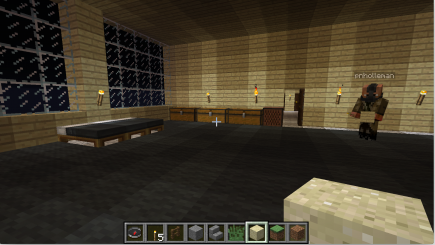 No, a more open layout is better, with counters serving as the boundary. Here’s the view from the front of the store. Let’s add in some decoration. 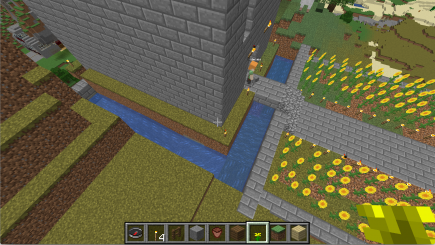 That worked pretty well, let’s repeat the process a little bit further down along the wall. I’m eventually going to want to connect up to where the light is on the back wall. 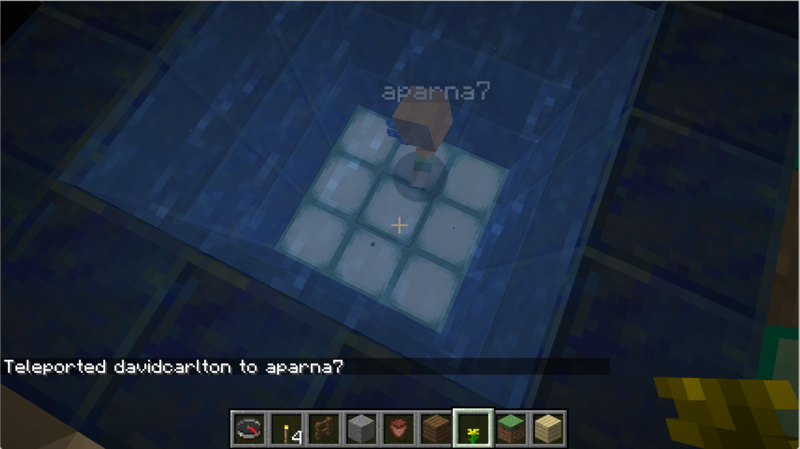 Next, I decided to check in on other people. 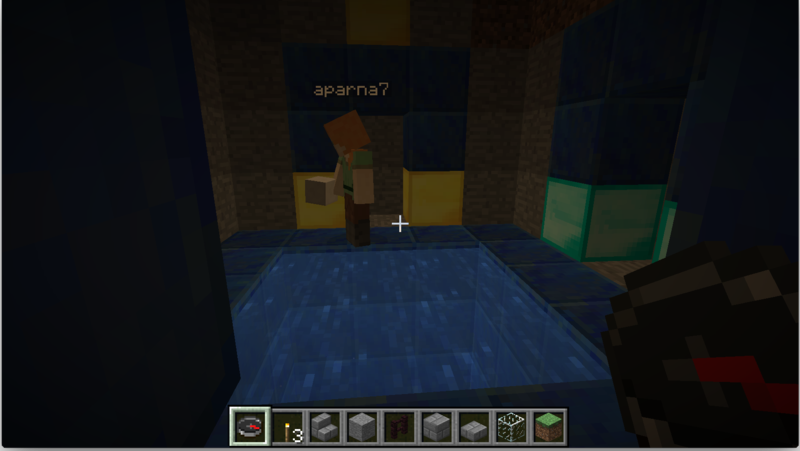 Miranda was working a bit more on the inside of her pyramid (or whatever this crypt thing is); Patrick was wandering around looking at rendering changes in the latest version. 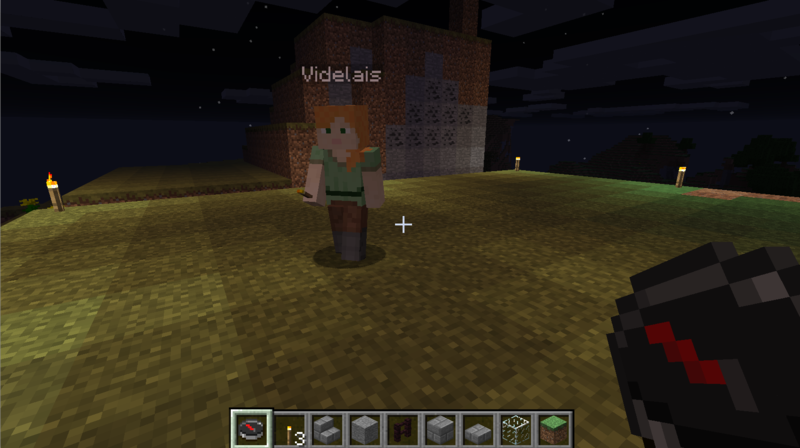 Looking at what Miranda is doing. 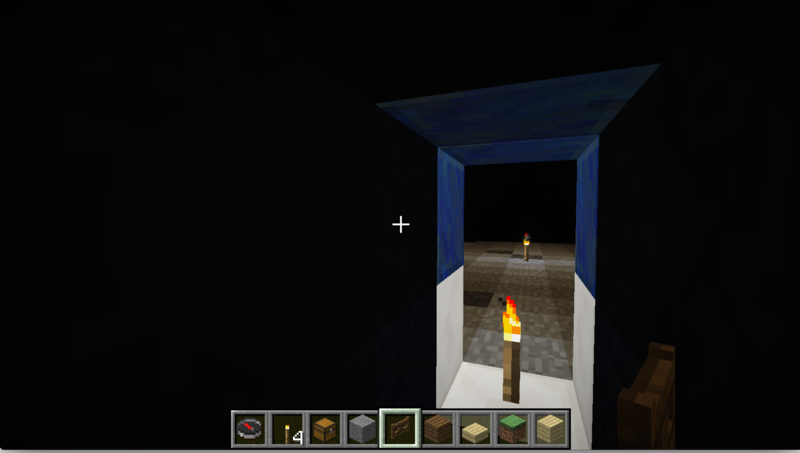 A doorway surrounded by darkness. 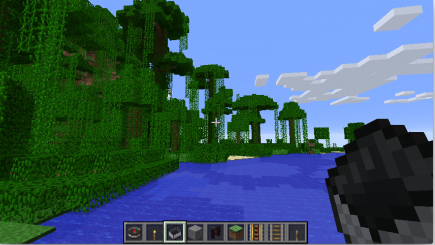 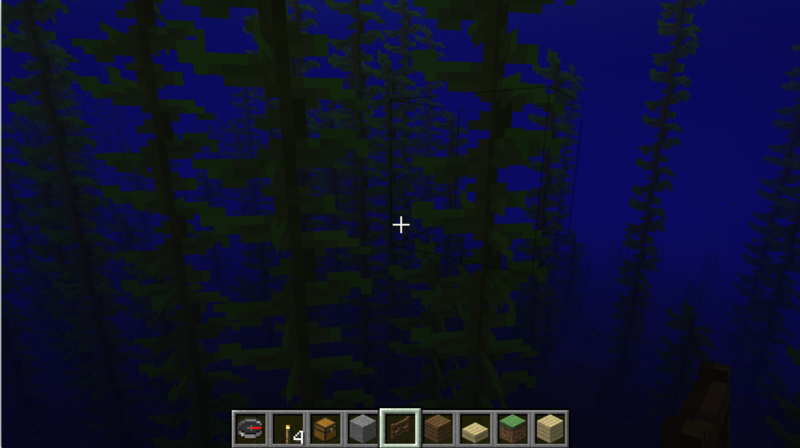 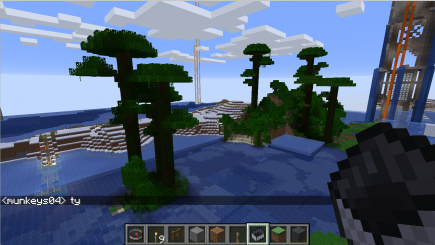 A forest next to water, with a lava crevasse. 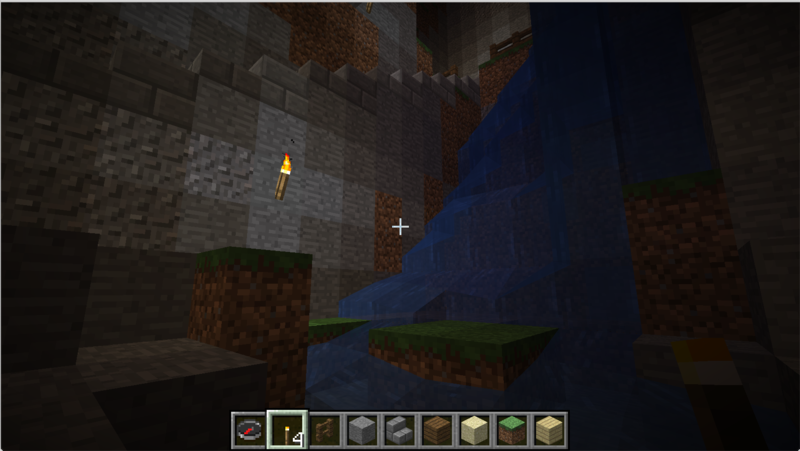 Looking more closely at the crevasse. 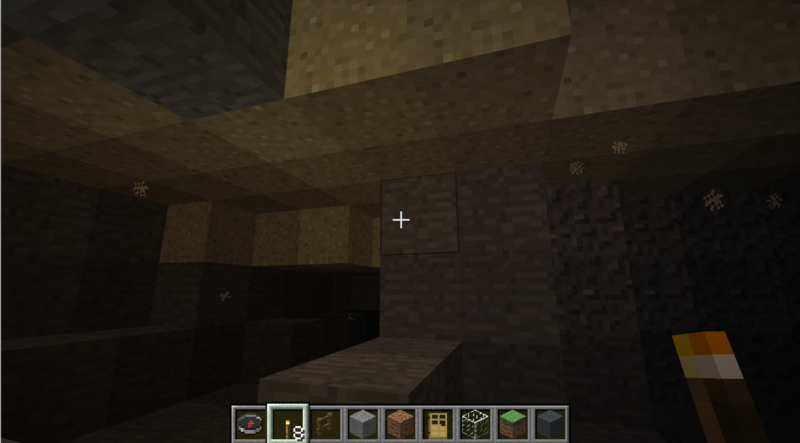 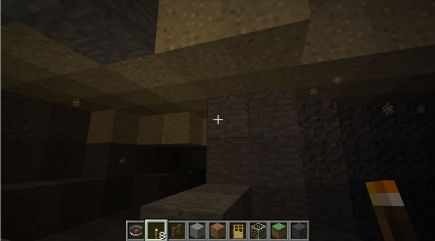 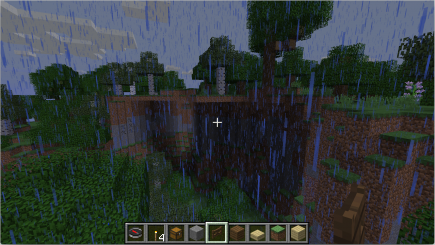 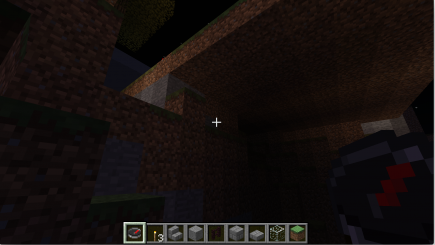 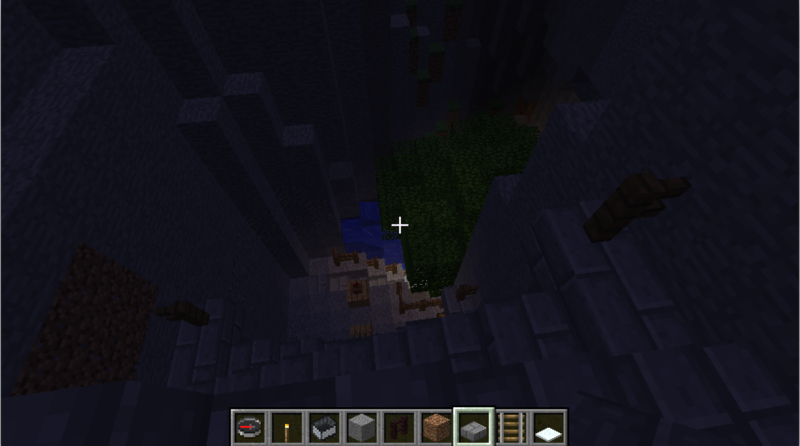 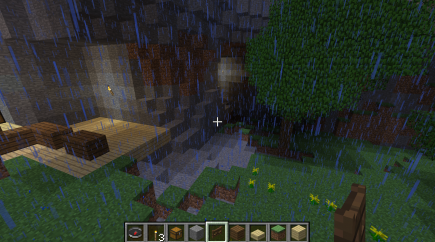 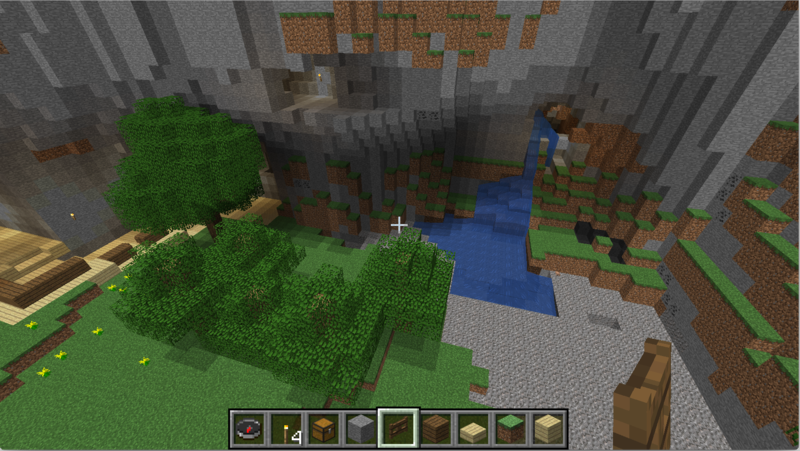 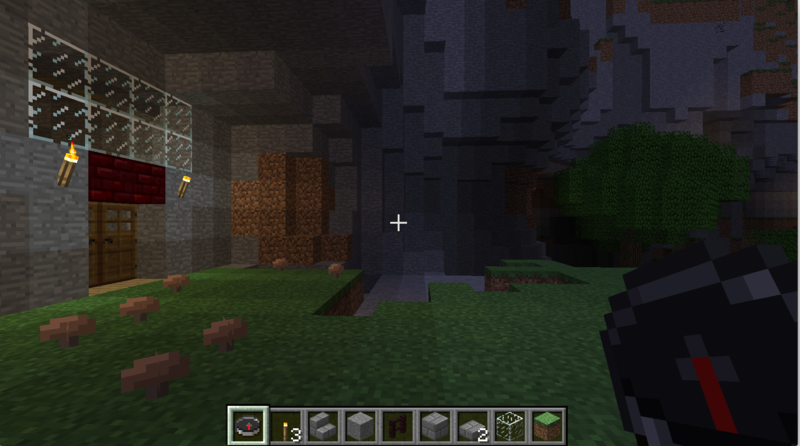 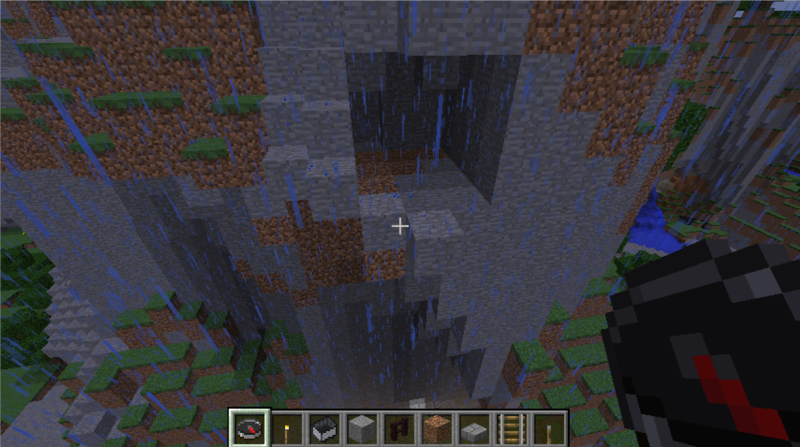 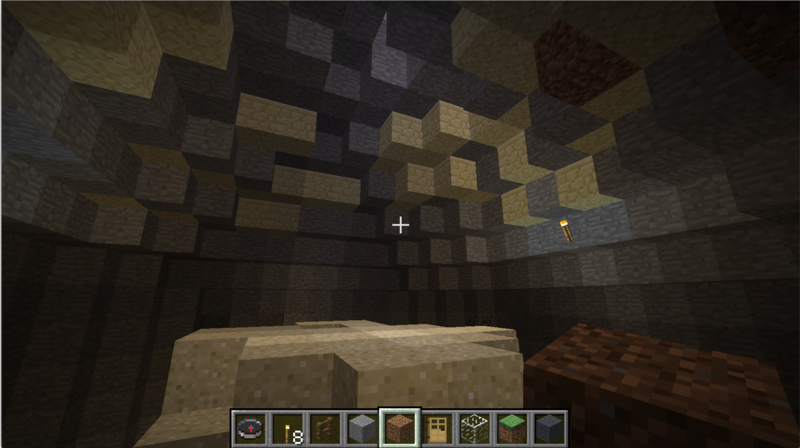 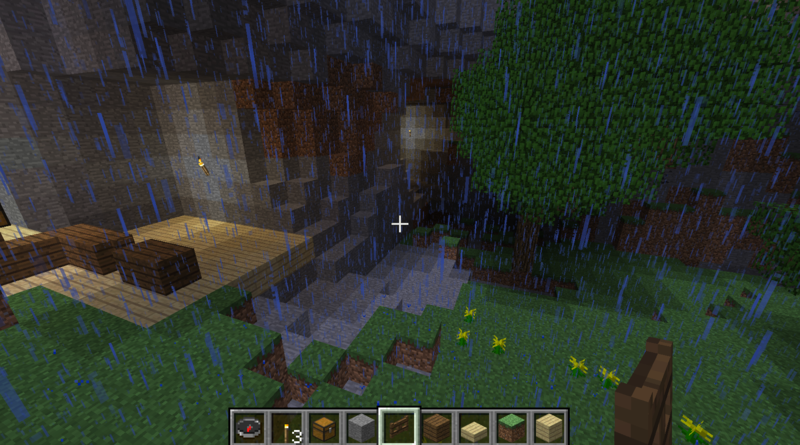 A really weird two-level forest: there’s this one-dirt-brick high land with trees on it above a cave. 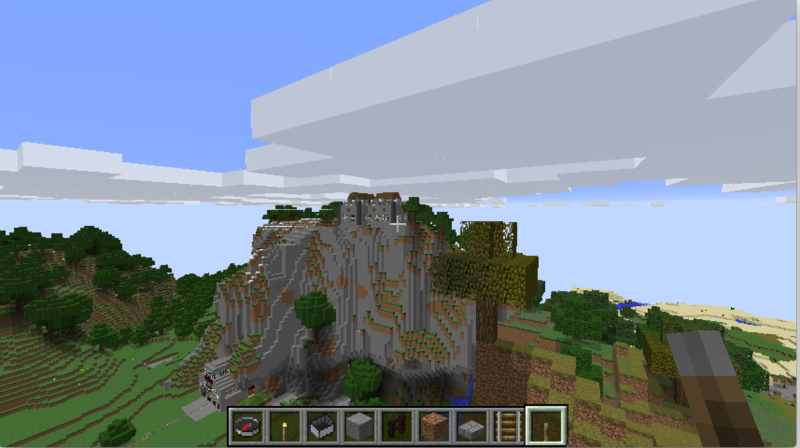 A little floating island above some mountains. 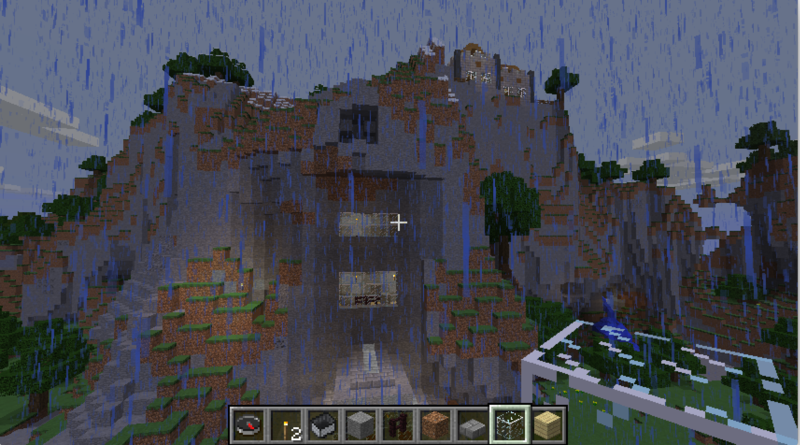 A bit of rendering weirdness on a nearby mountain. The room is unfortunately asymmetric. 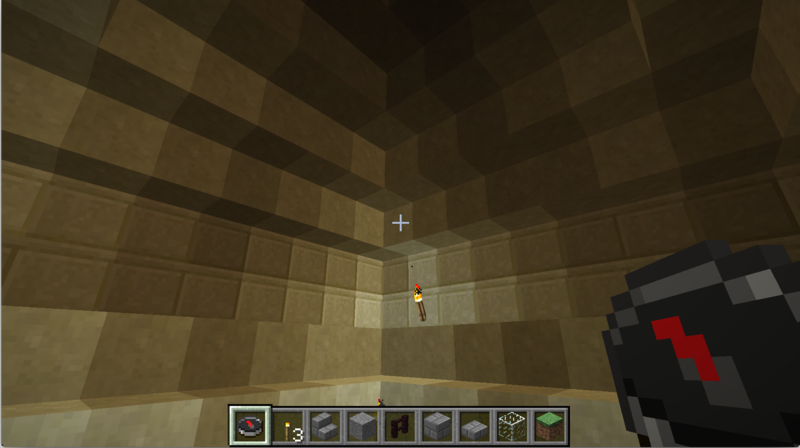 Digging out the inside to make it symmetric. Let’s make the ceiling a little higher. Now let’s build some steps up through the ceiling. 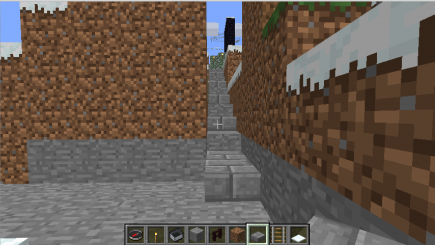 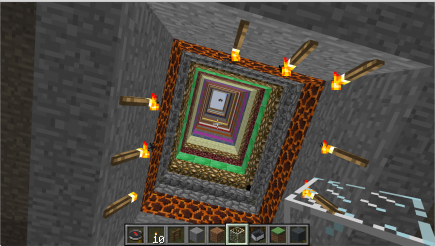 Stairs seem nicer than blocks. 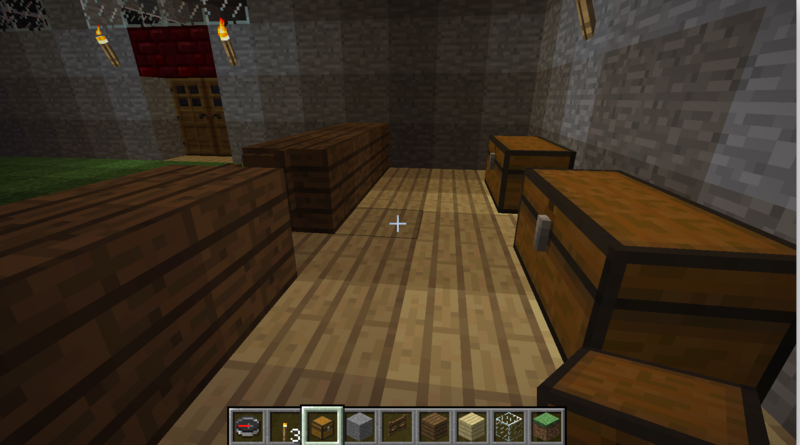 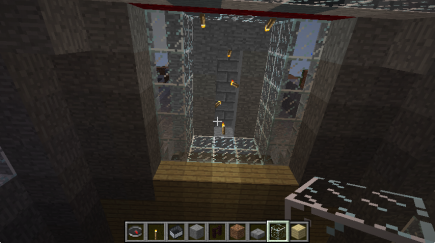 Once that was cleaned up a bit, I looked around outside; after wandering around a bit, I decided to build a path from the stairs above this room to the castle at the top of the mountain. The view from the top of a second set of stairs. The top part of the path, looking out from the flat area near the castle. 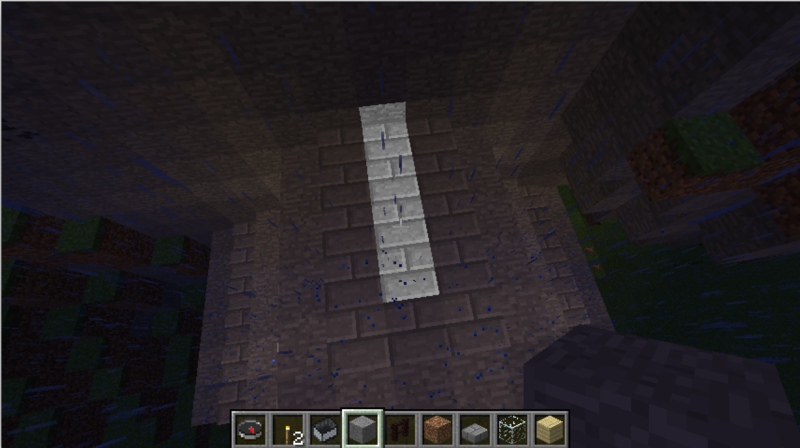 Let’s add a bit of color to mark the horizontal part of the path. 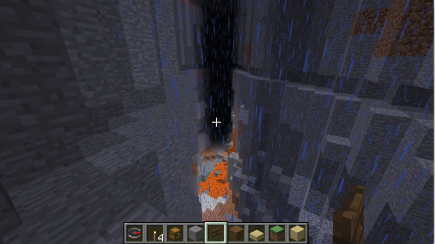 The path was a bit narrow, let’s widen it. Here’s a view of the whole thing. I think the next thing I’ll do is to fill this bit in with a building of some sort. 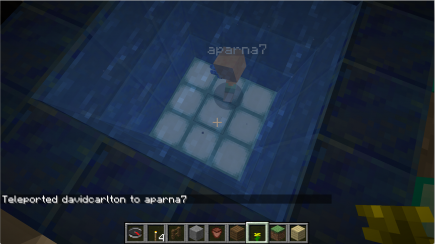 When I teleported to her, she was working on a pool. 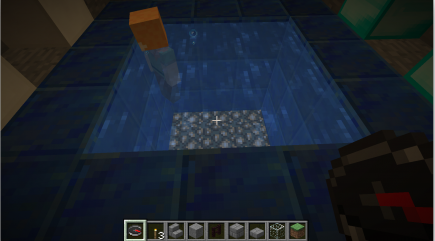 Light at the bottom of a pool. 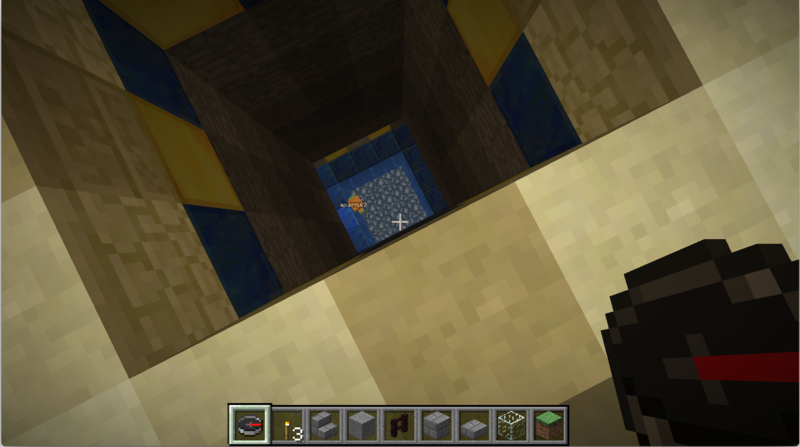 The pool is at the bottom of a shaft. 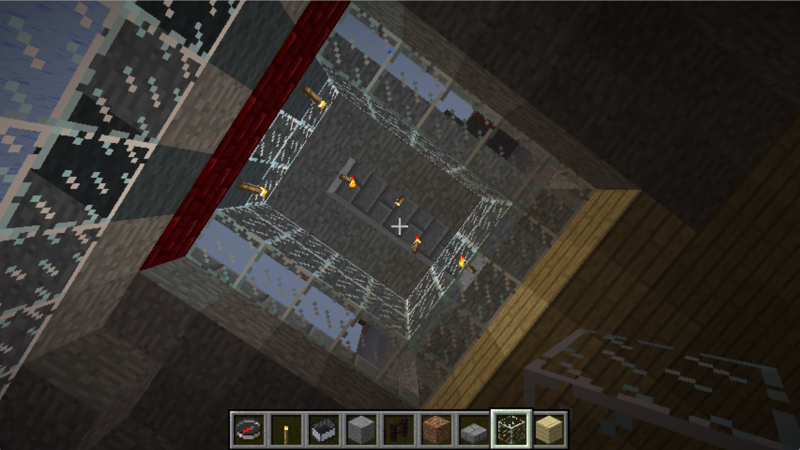 Here’s the room at the top of the shaft. 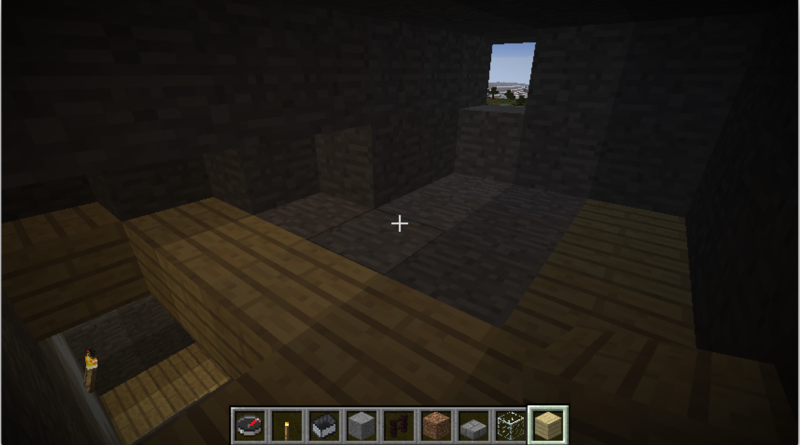 An attic room with a rough wood wall / ceiling. 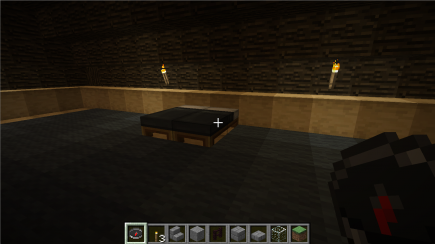 Adding a bed next to one of the walls. 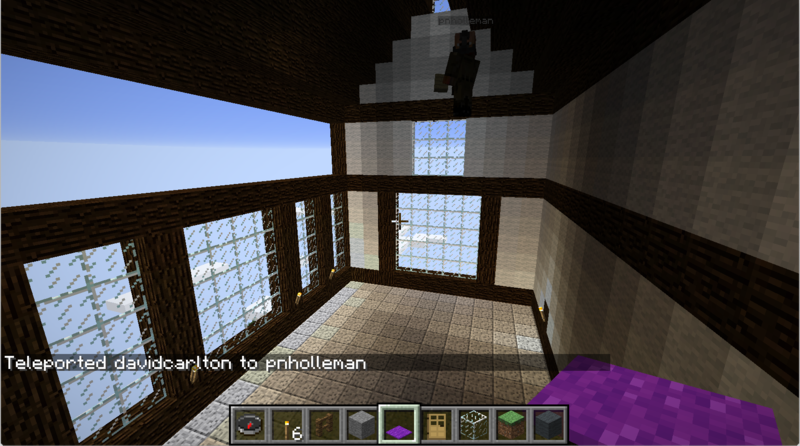 There’s a balcony off of one end of the room. 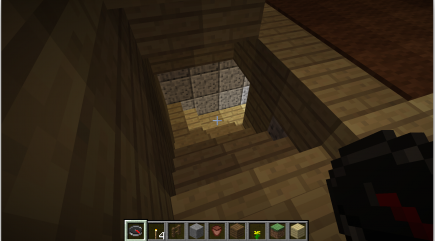 The stairs down from the attic. 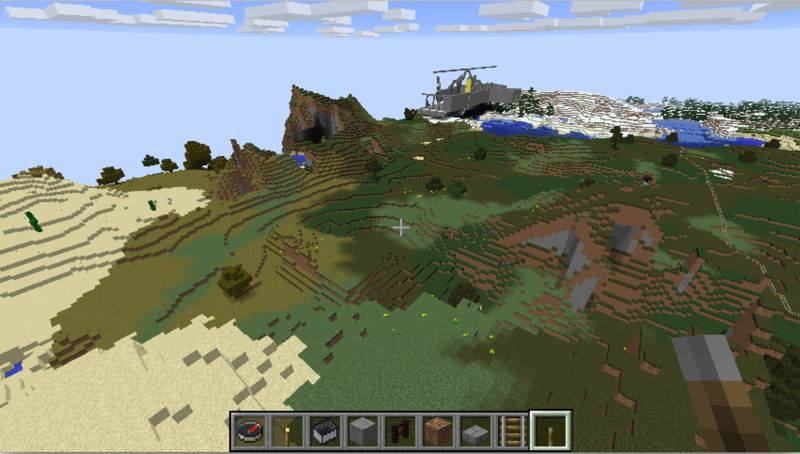 A view of the (setting? rising? 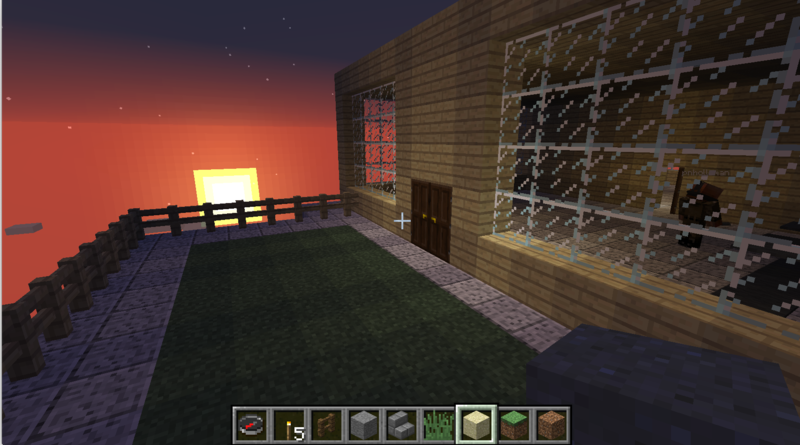 probably setting) sun through the window. One last look at the swimming pool. 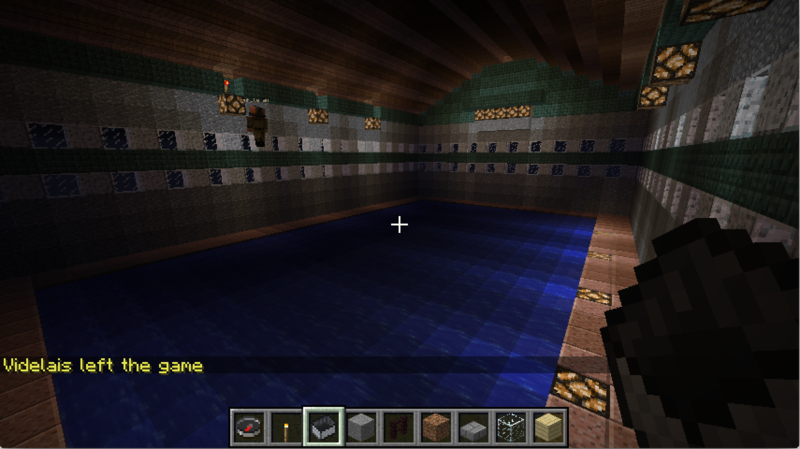 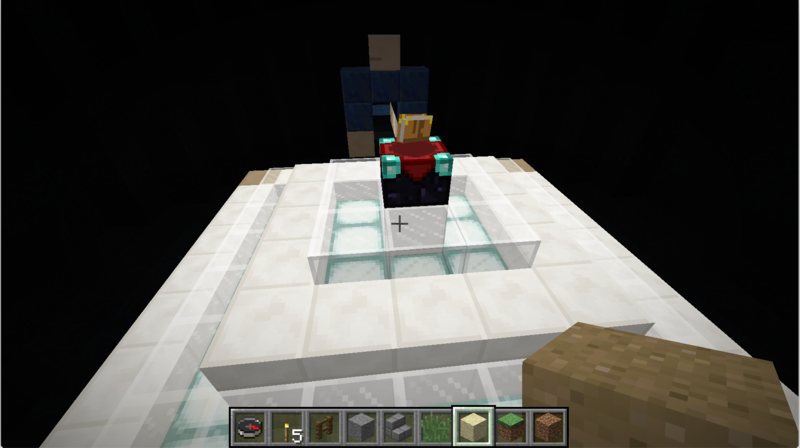 A top view of the finished swimming pool. 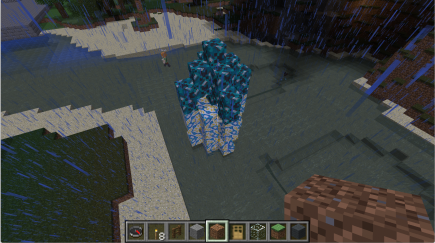 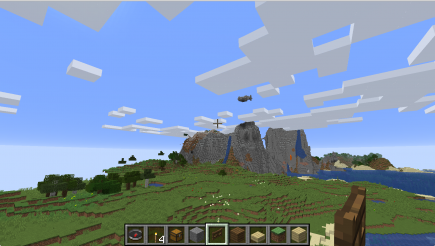 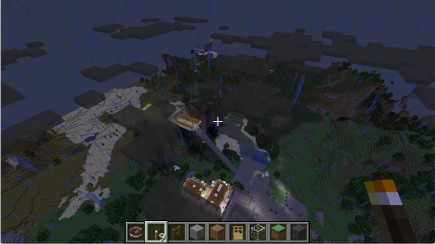 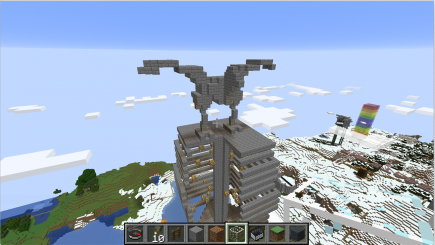 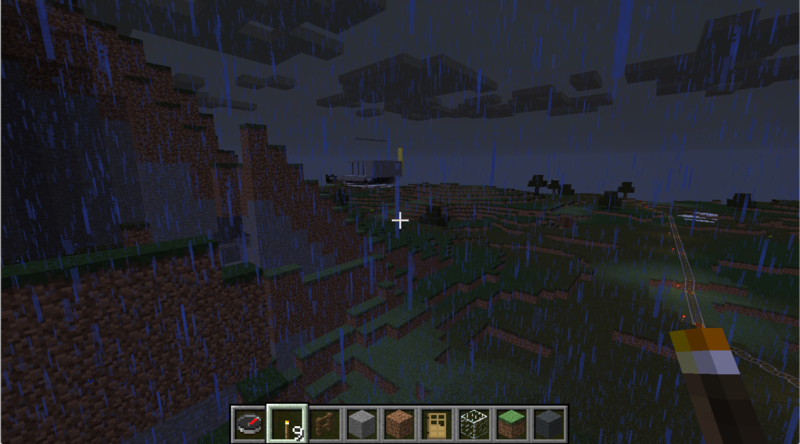 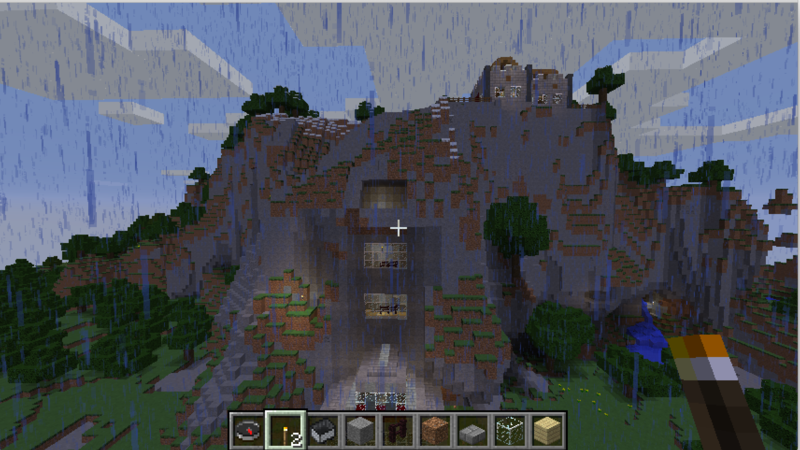 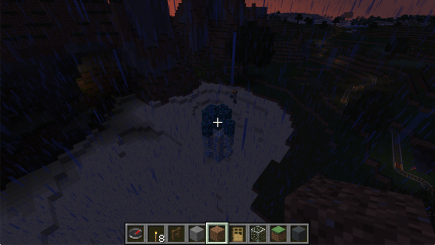 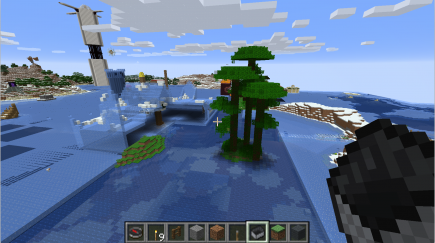 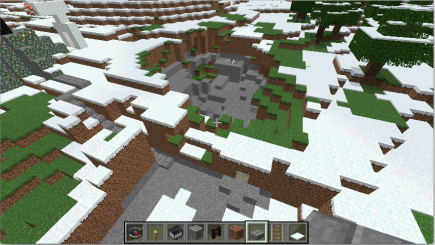 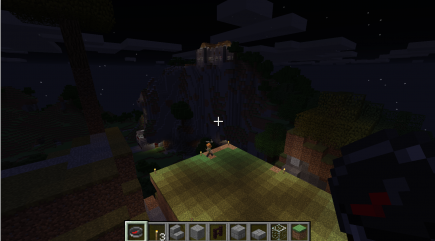 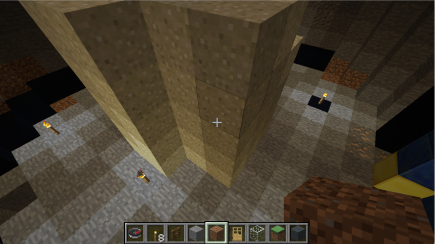 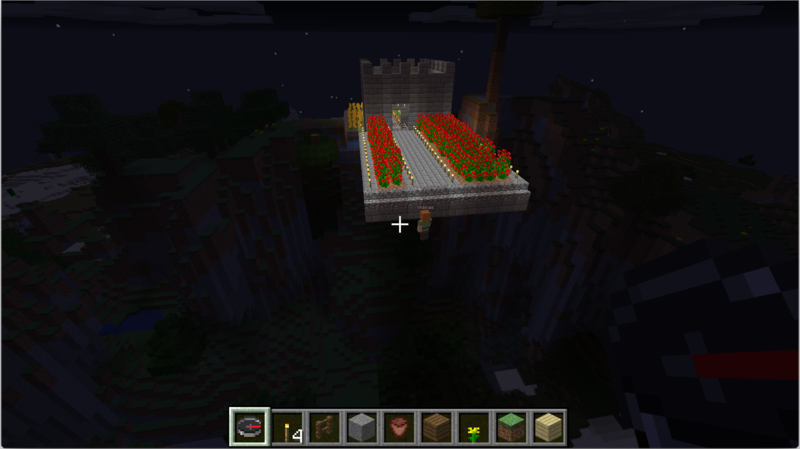 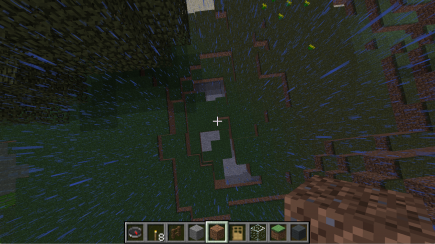 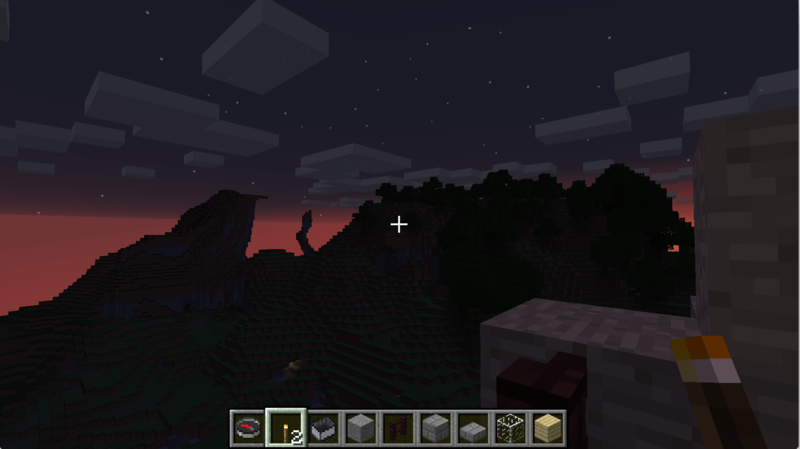 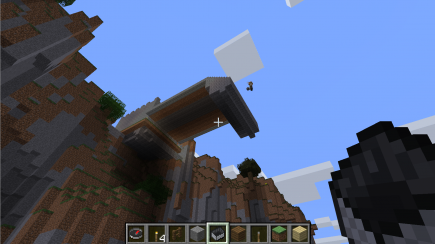 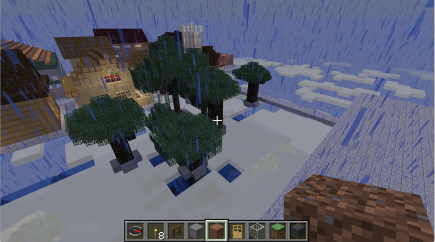 And it turned out that Dan had started building on a mountain next to the one I’ve been working on. 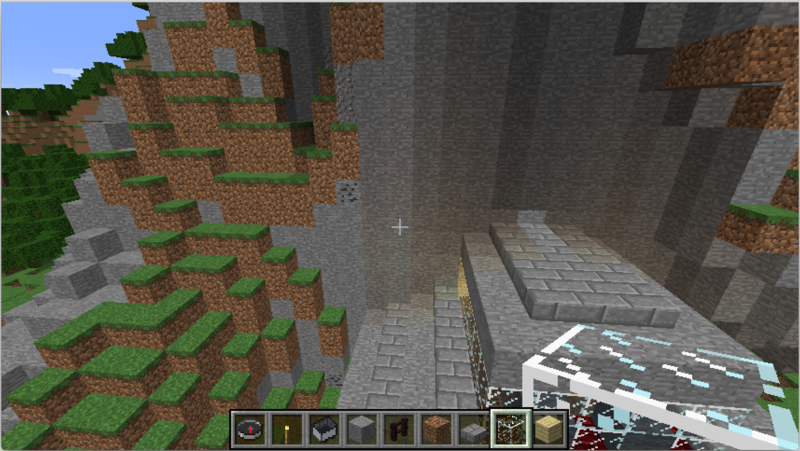 A bit of space beneath the plateau. 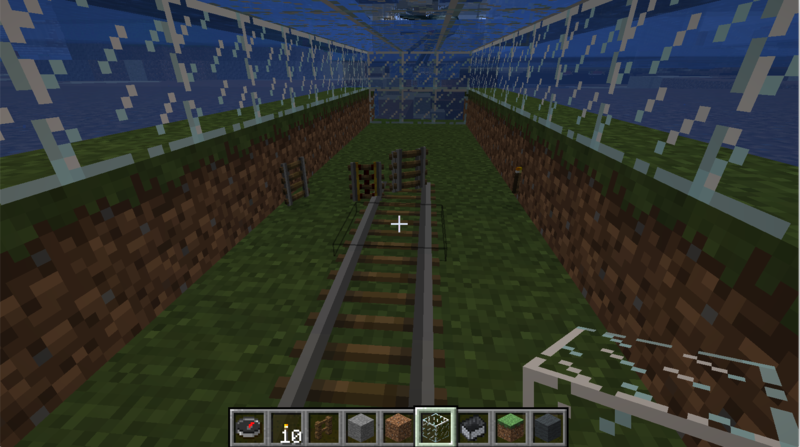 In the June Minecraft session, I wanted to continue building floors up above the train station, continuing the work from May. 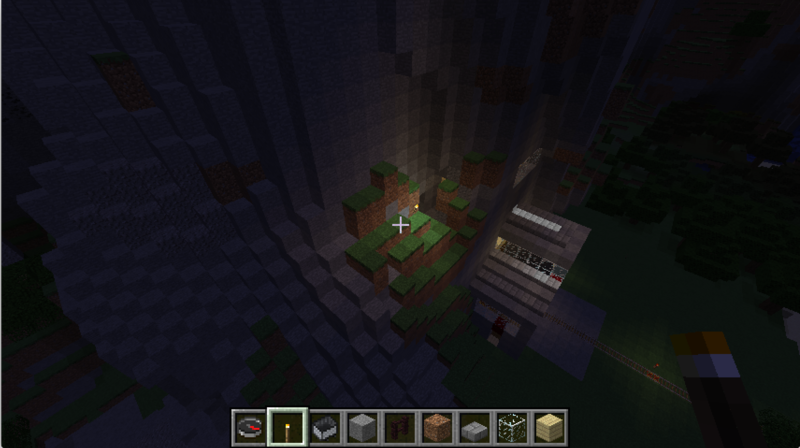 A light in the forest that I saw when traveling back. A side exit from the third floor. 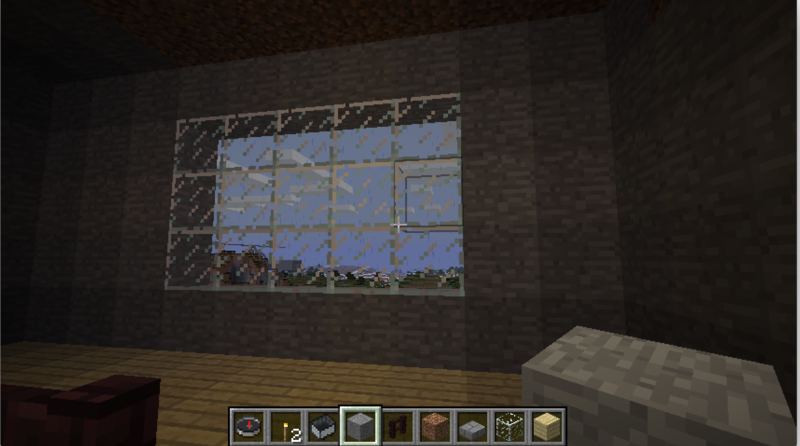 Looking out the third floor window. 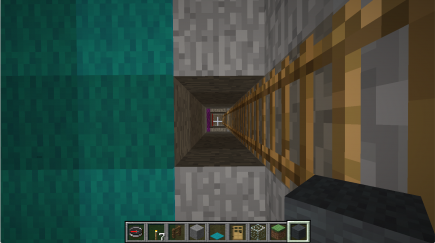 Where exactly do I want the next floors to be? Looking around the top of the mountain. 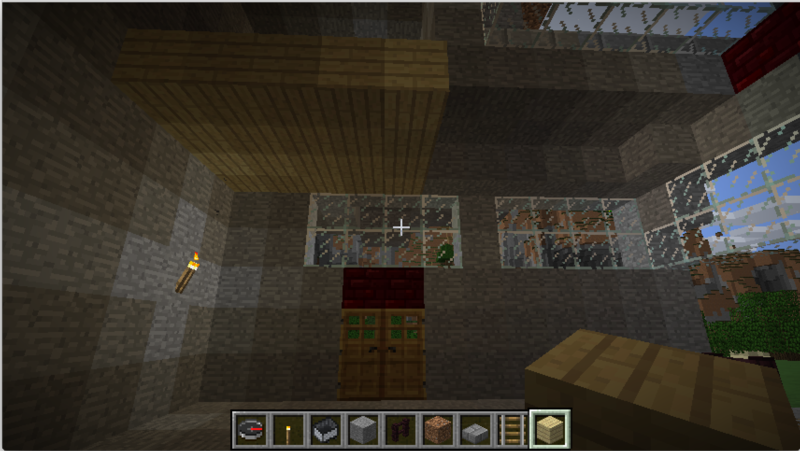 Before, I’d built a second floor (basically looking out through the top of the train station) and a third floor (the window visible in the fourth picture above). The third floor has a side exit which, unfortunately, doesn’t seem to connect anywhere particularly productive: there’s really not a way to make a path going up the mountain from it, and there’s what looks like it could be a mountain entrance behind it, but it ends almost immediately. 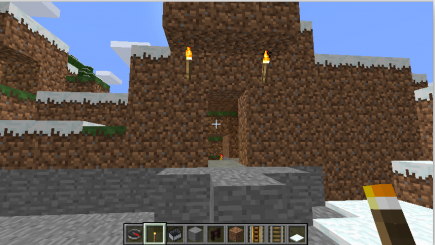 Going up the mountain is more promising, though: near the top, there’s an existing opening into the mountain. So I should try to add more floors going up such that one of them naturally comes out into that area; and also maybe I can make a path from there to the building that’s already on the top of the mountain? So I decided to start by building a fourth floor that’s the same height up from the third as the third is from the second, and see where that leaves me. Digging out the fourth floor. Fourth floor window from the outside. 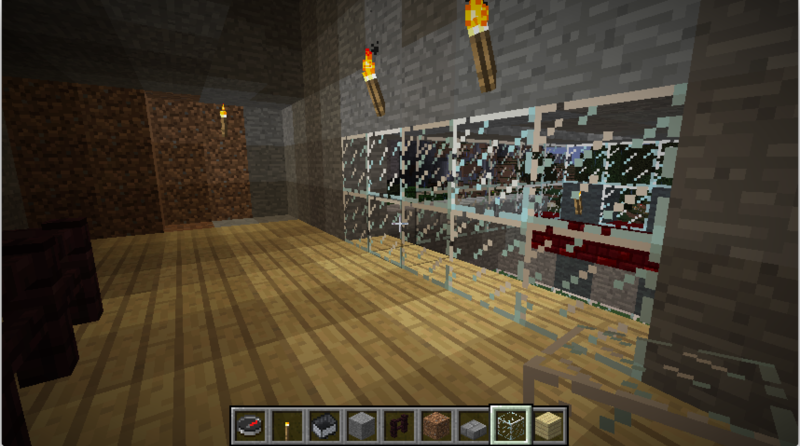 Putting some glass in place. Looking at the outside view, it starts to become clearer. 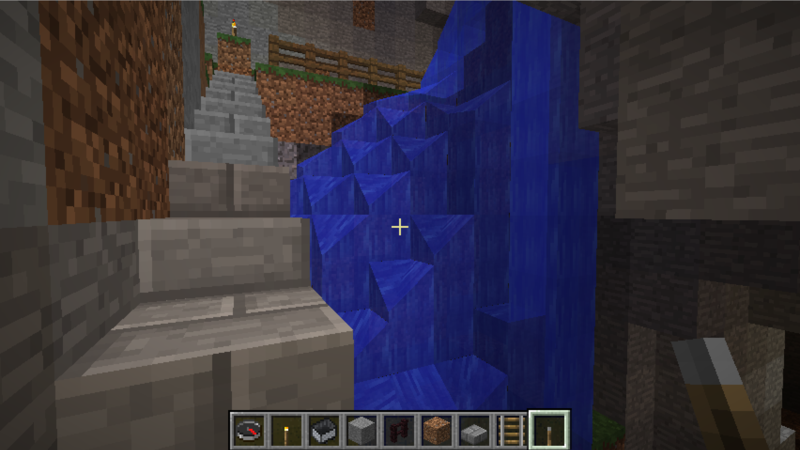 There’s a lump of mountain blocks on the right side (looking from the outside) that make a bit of a mess, so I’ll want to clean that out to have an even wall. And the fourth floor is a little uncomfortably far from the hole at the top, so I need to figure out what to do about that. 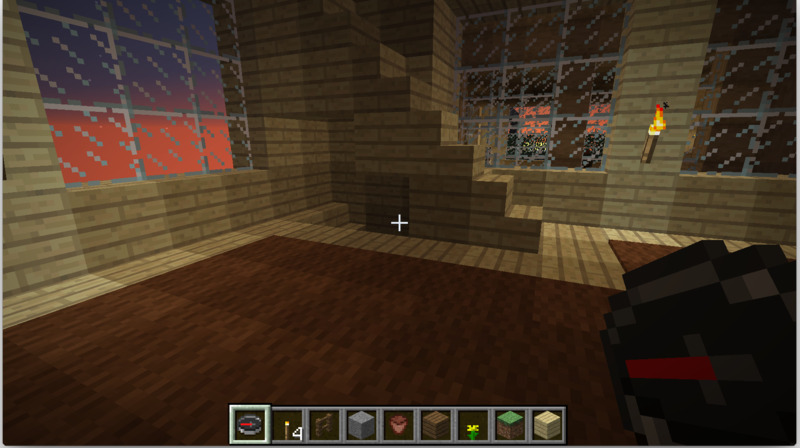 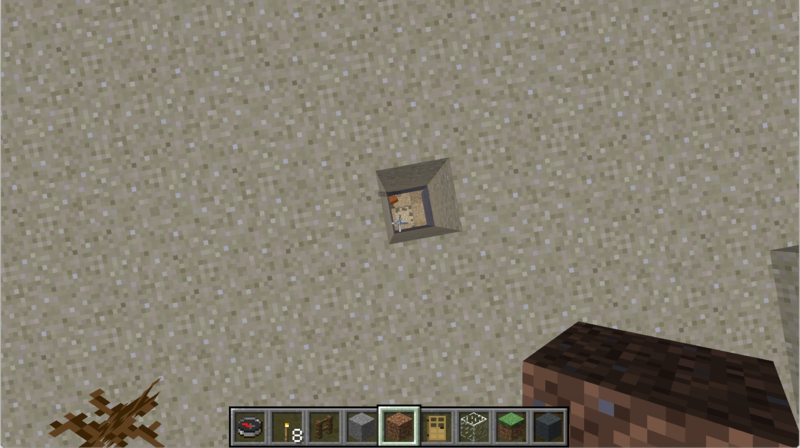 I decided to embrace the extra space between the fourth floor and the hole at the top: that hole actually sticks out a bit, so I can think of it as a balcony, and so having a couple of blocks of floor sticking out beneath it makes sense, which will take up some of the space. But even so the amount of space is a little large, and actually there’s a little more space between the third and fourth floors than I’d like: so I think a three-high window would provide more balance than the two-high windows I’d been using. 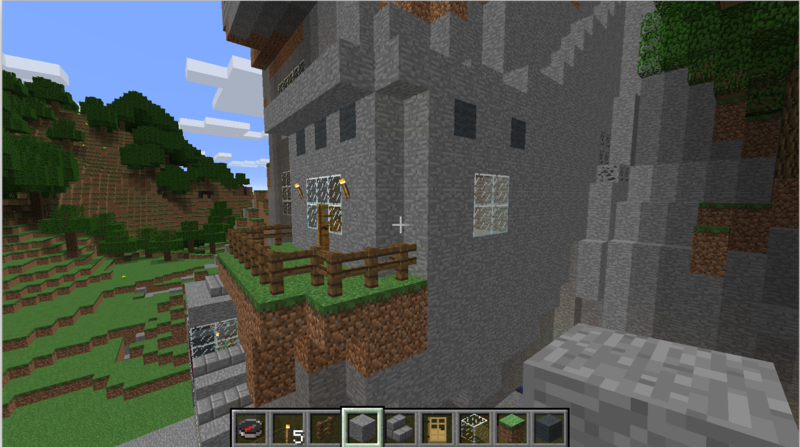 Here’s the view with the front leveled out and with a three-high third-floor window, that does look better. 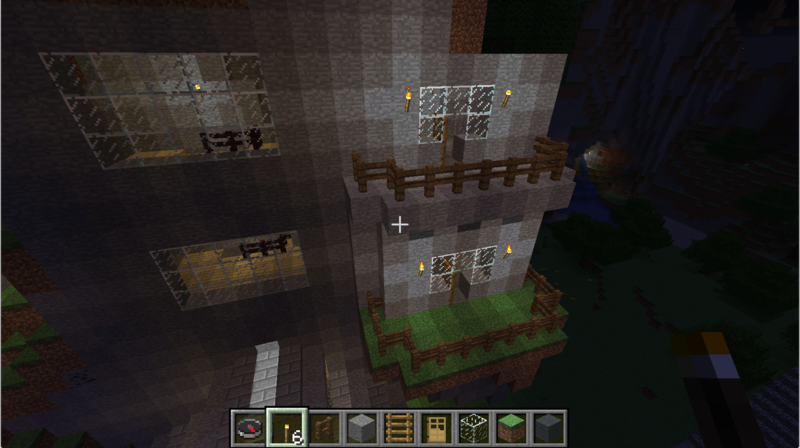 Outside view with the third and fourth floor windows and surroundings in a good state. A strange strip of light at the top of the train station; apparently light can shine through half-height blocks? 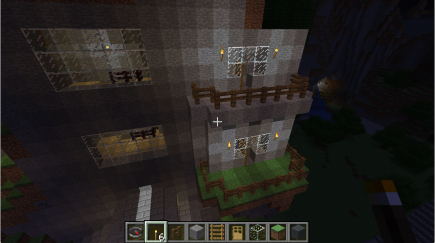 After that, the spacing looked good: two spaces above the fourth floor and then two spaces of balcony floor left a good balance. Digging out the fifth floor, reaching the balcony. 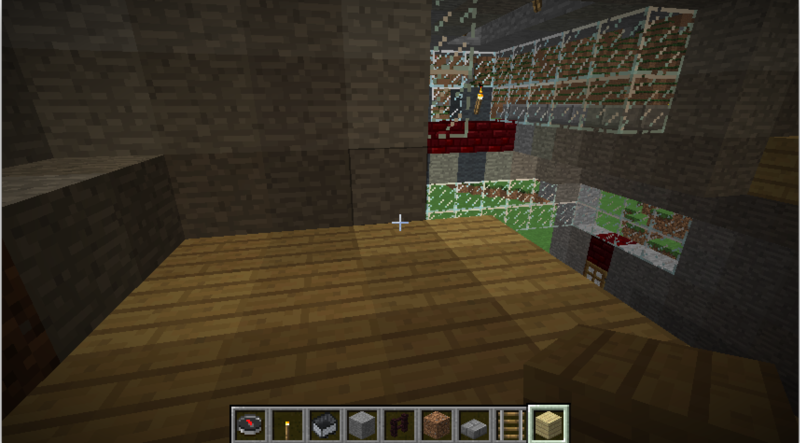 Making the balcony width match the other floors. The balcony sides are asymmetric, I’ll need to clean that up. 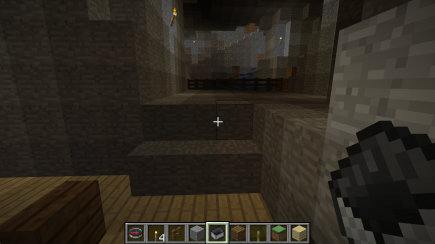 Cutting back the right side and adding in a railing. 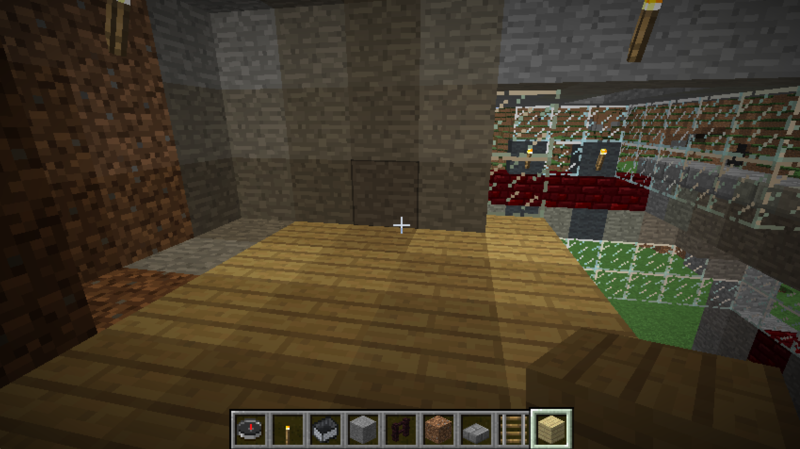 Let’s use stone brick for the floor here instead of wood. 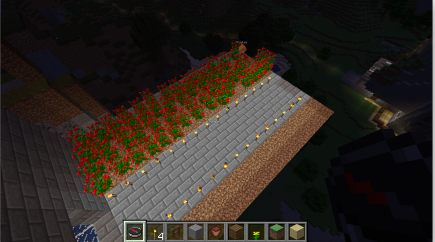 So now I’m almost done with the area above the train station. 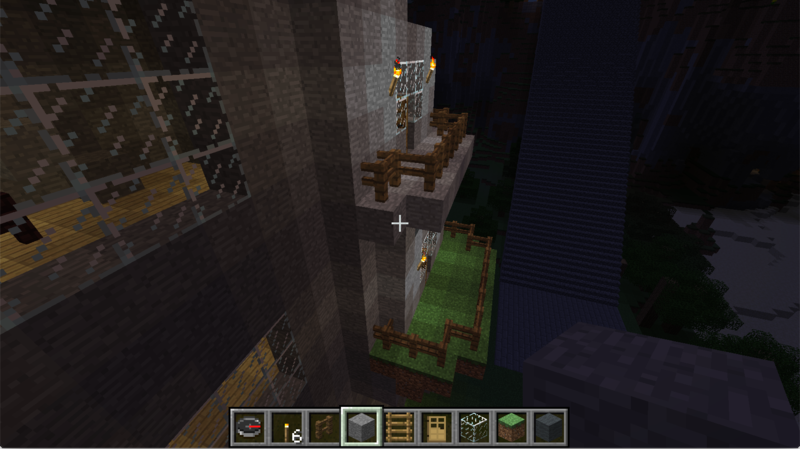 I’ll need to clean up the balcony level a little more, probably; I’ll probably want to provide access from it somehow to the building at the top; I might want to something out of that little green exterior area on the third floor; and I might add some interior furnishings. But basically that phase of the construction is done, I’ll want to figure out which part of the mountain to build out next. 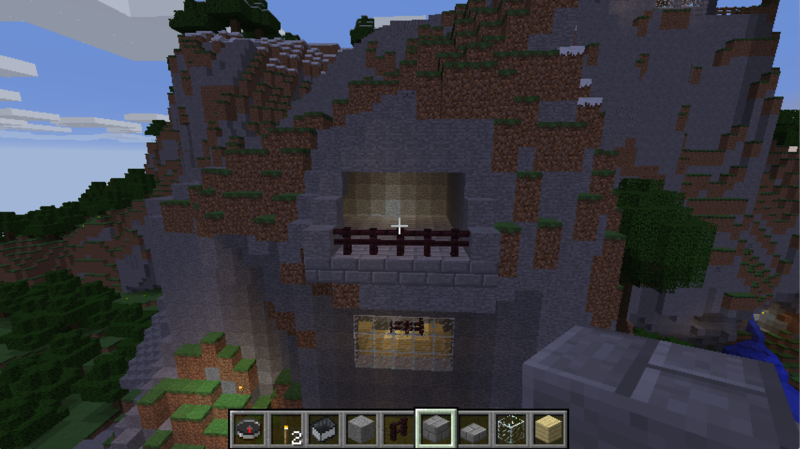 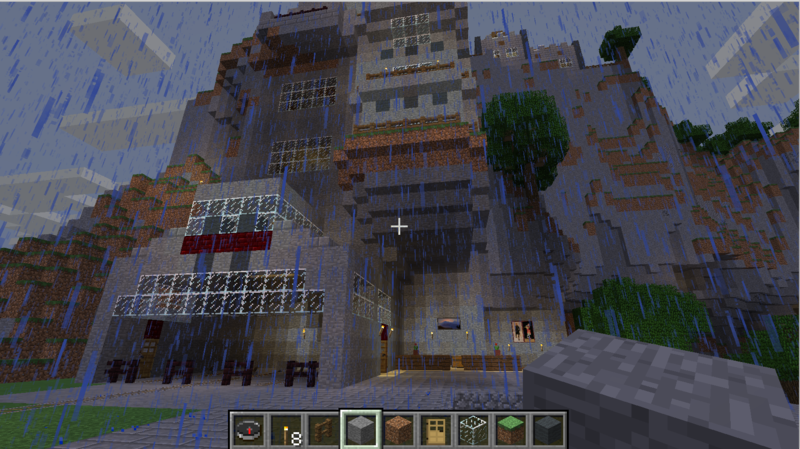 For the May Minecraft session, I continued the work of vertically extending the train station that I’d started in April. 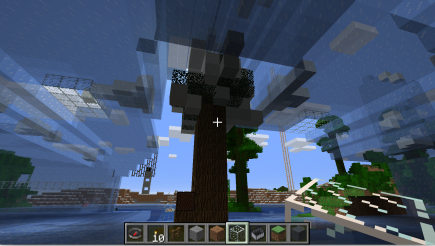 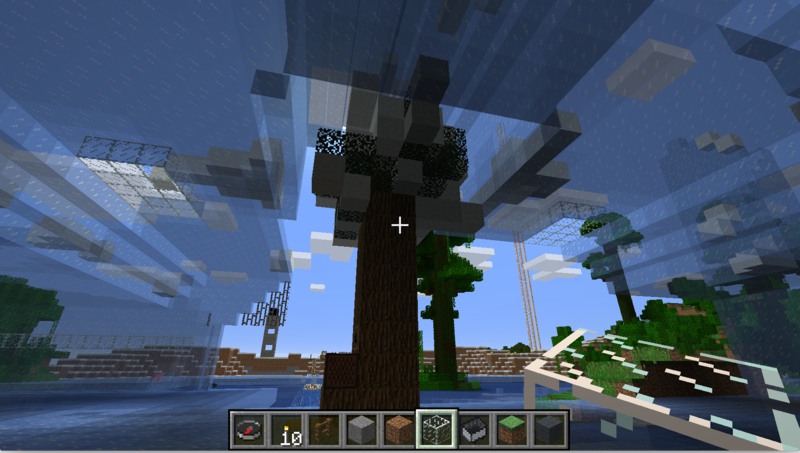 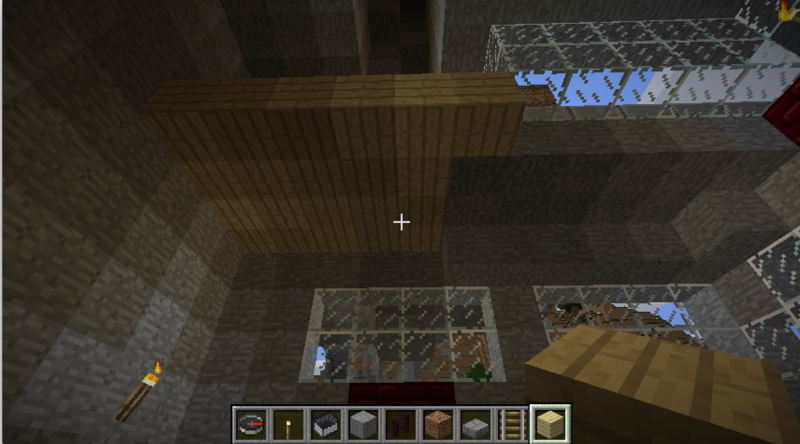 Looking up in the middle of the train station; the wood is the side where I’ve built a second floor. The second floor now has a window into the body of the station. 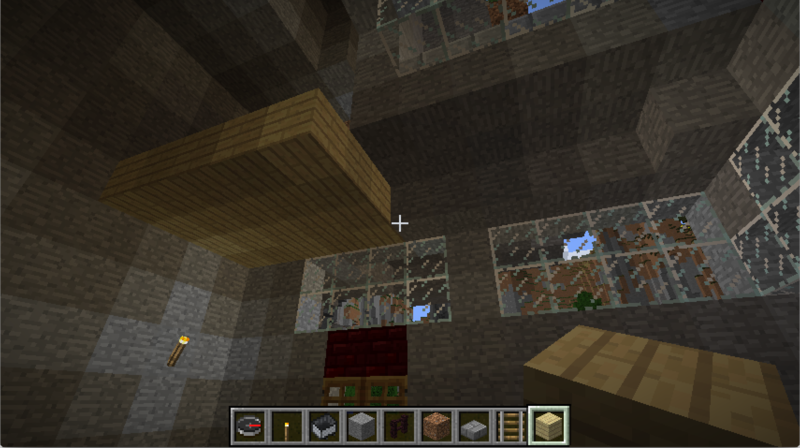 Looking up and back into the second floor. Looking across the second floor; I’m really not sure what to do with the dirt area on the end. 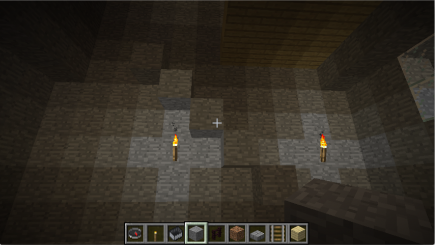 Digging up so I can put in a third floor. Once the second floor was done, I needed to figure out the third floor (and potentially higher floors) – how high up can I go, anything I need to worry about on the sides, anything I can actively connect with on the sides? 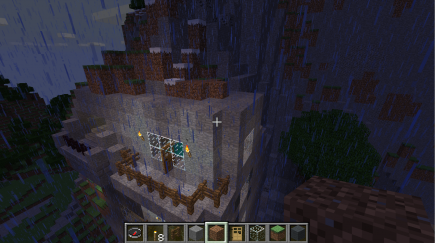 I’ve cleaned off the front, so I can potentially go up for a while. 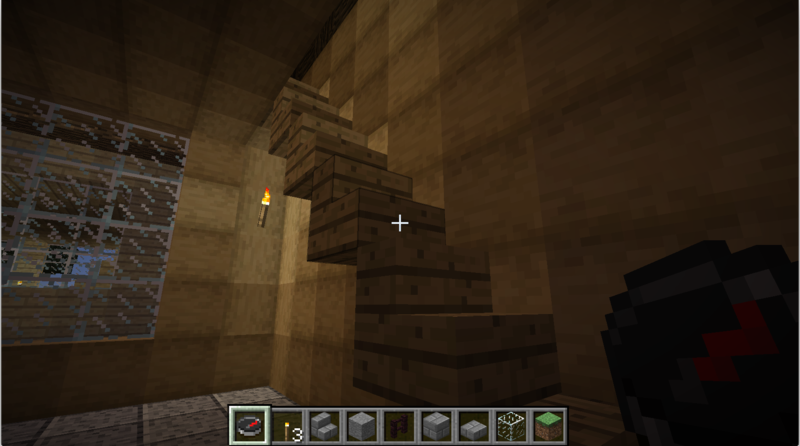 Reminding myself how the stairs worked on the first floor. 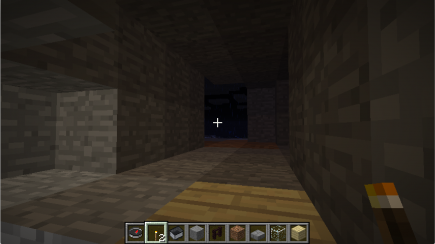 The third floor, dark and empty right now. 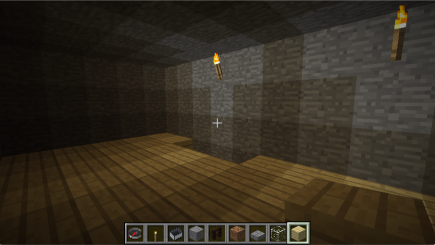 Let’s get some light in here. 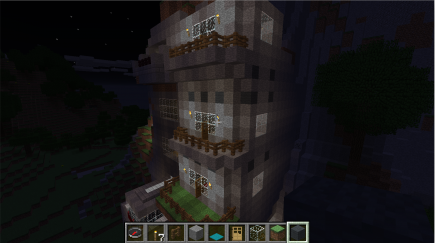 Here’s what it looks like from the outside. The view out the window at dusk. 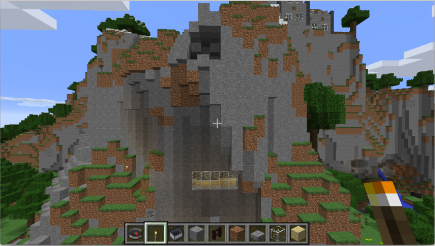 Adding a side exit: on the side away from the weird blob, there’s a green bit of mountain that seems worth connecting to? 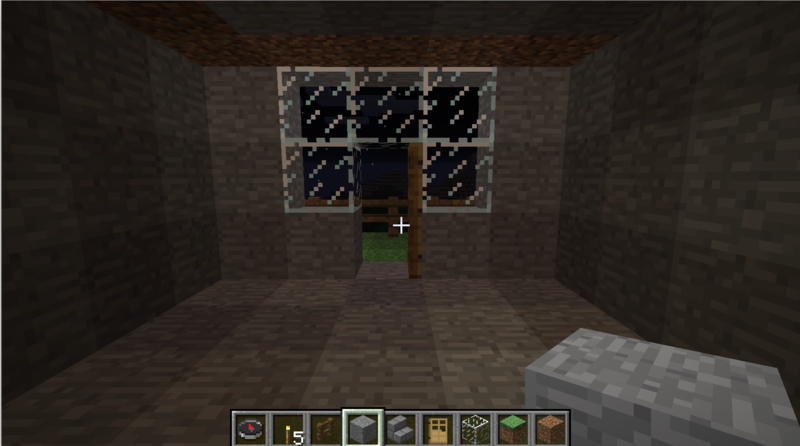 What will come out of that connection to the outside in the last picture? 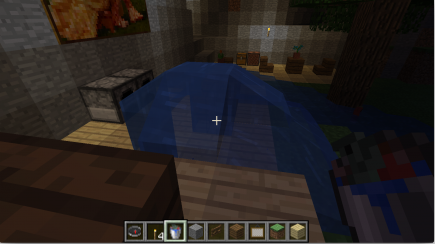 What about the blob on the other side? 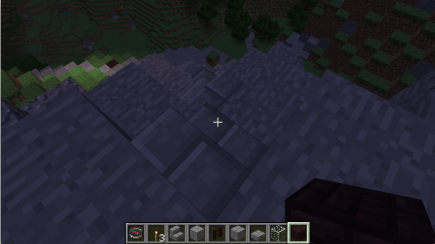 How far up can I go, and what happens when I reach the top? Pat’s swimming pool; I like how the green and the reddish-brown work together. 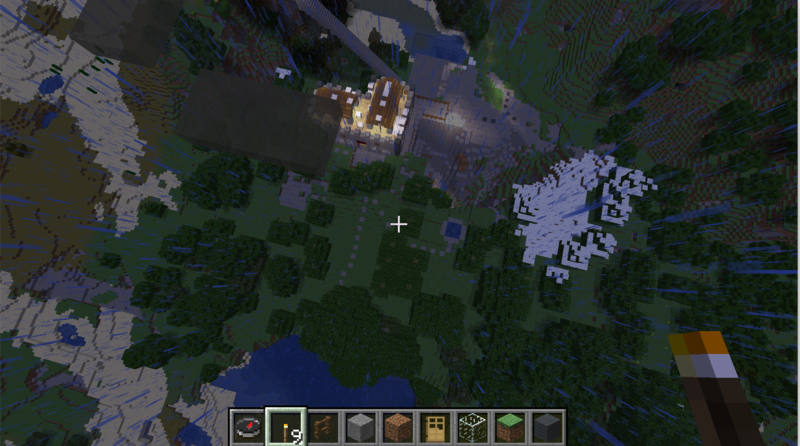 A view at a bit of an angle. Looking down from the top of one of the light fixtures. An outside view at night. 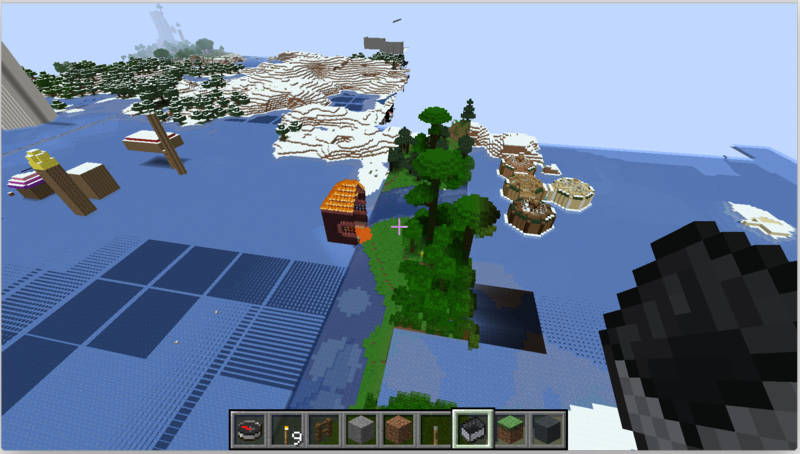 Here’s the floating town during the day. I started off the April Minecraft session by working a bit on the station near the city. 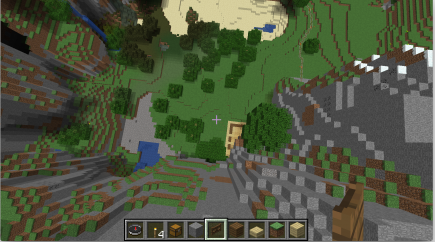 Here’s a top view; how do I want this to fit into the surrounding areas? 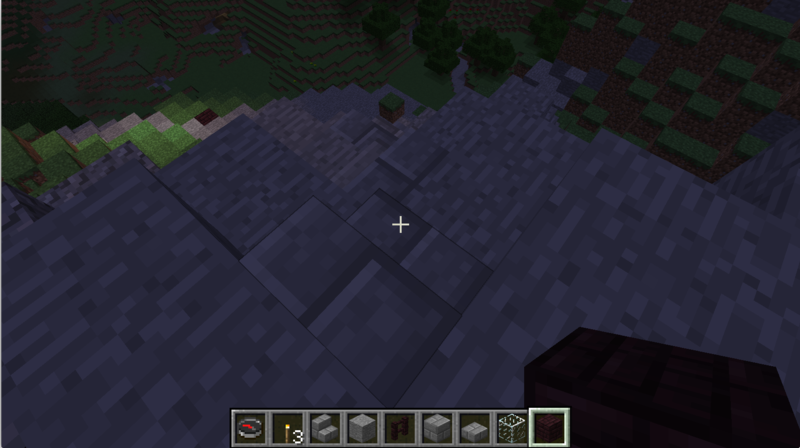 After that, I flew back towards the mountain to figure out what to do there. 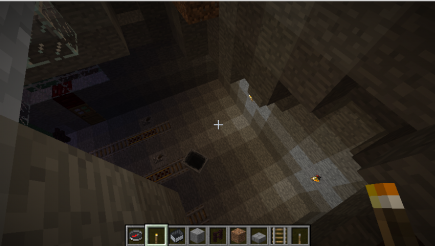 After looking around, extending vertically from the back of the station seemed like the next step; there was already the beginnings of a space on the inside, and there’s a natural hollow if I head far enough. Maybe the floor should be one block lower? 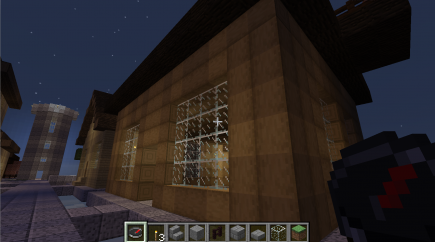 At this point, I ran out of time, so I went to take pictures of Dan’s latest building.